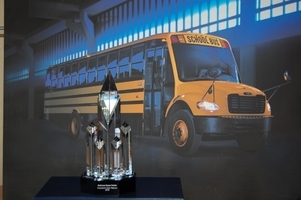 Matthews Bus Alliance was selected as the 2018 Thomas Built Buses Dealer of the Year for the very first time at the Thomas Built Buses North American Dealer Sales Meetings held at the brand new Gaylord Rockies in Denver, Colorado. Pictured are: Glenn Matthews, President, Lori Matthews, Operations Manager, and their Daughter Justine Matthews. 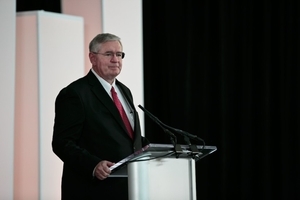 Caley Edgerly, President TBB, in his speech cited many key factors for "Choosing Matthews," including market share, sales volume, large percentage sales increases year over year, and a Daniels Group Net Promoter Score of 100% customer satisfaction for 2018. 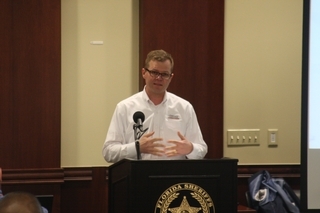 He specifically referenced the Team’s passion for doing the right thing for Fl customers, employees, and community. Thanks for "Choosing Matthews", Ken Hedgecock, VP Sales and Marketing, Caley Edgerly, President, Link Roland, Regional Sales Manager, Jim Crowcroft, National Sales Manager, Ronnie Cobb, Regional Service Manager, Paul Start, Platinum Support Manager, Jamie Allison, Training Manager, Vance Nofzinger, Mark Childers, Ricky Stanley, Chirs Blaha, Sid Adams, Dee Dee Campbell, Mike Stotler, and the many other key people at Thomas Built Buses who support our efforts in Florida. 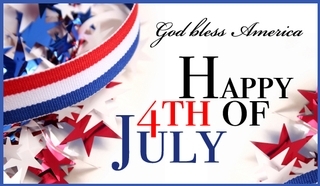 Thank you to our great customers, employees, and suppliers. A final thank you to Kieth Courtney, Dave McCavoy, and everyone at Daimler Truck Financial. This humbling honor will serve to help re-focus us as a TEAM so we work even harder for customers in 2019. 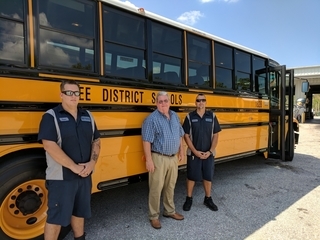 Andy West, Transportation Director, David Bowman, Lead Shop Technician, and Mike Judd, Fleet Maintenance Supervisor, Flagler County District Schools take delivery of their New 2020 Thomas Saf-T-Liner C2 buses with RAC air conditioning. 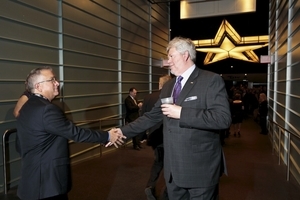 Tim Bevier, Account Representative, was on hand for the special occasion. Thanks for "Choosing Matthews," Flagler County! 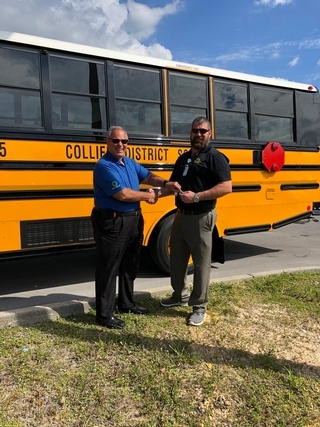 Director of Athletics, Rick Keating, Canterbury School, Fort Myers, receives the keys to their new Multi Function School Activity Bus(MFSAB) from Matthews Bus Alliance Account Manager, Cliff Clare Jr. This is the schools first new bus in 13 years. 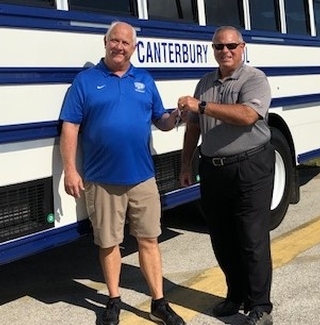 Canterbury School looks forward to transporting their Teams and going on Field Trips with their students in their shinny new C2. Thanks for Choosing Matthews, Canterberry! TEAM Matthews Bus Alliance technicians were at the Orlando location for a full day of training. Ali Rampartab conducted training classes for our team of technicians. 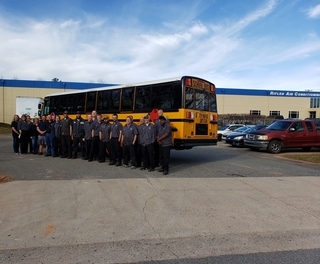 Thanks for choosing Matthews, the best school bus technicians in the word! 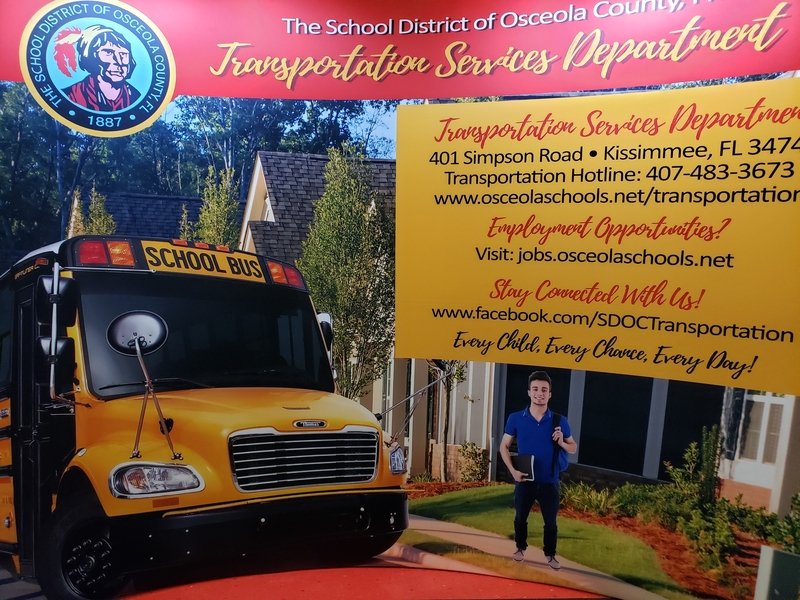 Pasco County District Schools started taking delivery of their NEW 40, 2020Thomas Saf-T-Liner C2 buses powered with the ALL NEW Detroit Diesel DD5 engine. 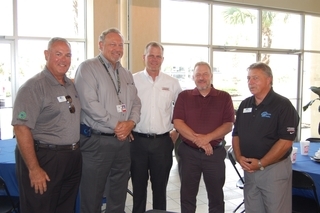 Tad Kledzik, Transporation Director, Emmett Thompson, Fleet Maintenance Director, and Jason Mendoza, Shop Manager Central Compound were on hand to accept the keys from Bob Dolan, Business Development Manager, Matthews Buses Florida. These 40 buses are the first of many Florida School Buses to be powered by this new diesel engine technology. 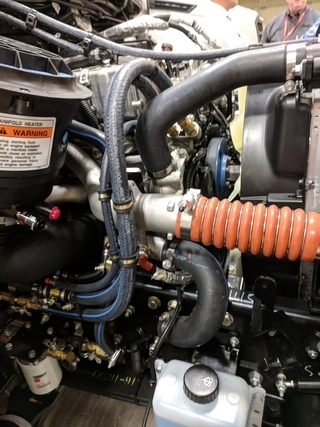 The DD5 is a 4 cylinder diesel engine designed with todays technology to have less regeneratons as a result of Variable Cam Phasing, improved fuel efficency, and 35,000 Mile maintenance intervals. Matthews Bus Alliance looks forward to pioneering this new engine into the Florida market with Pasco County. 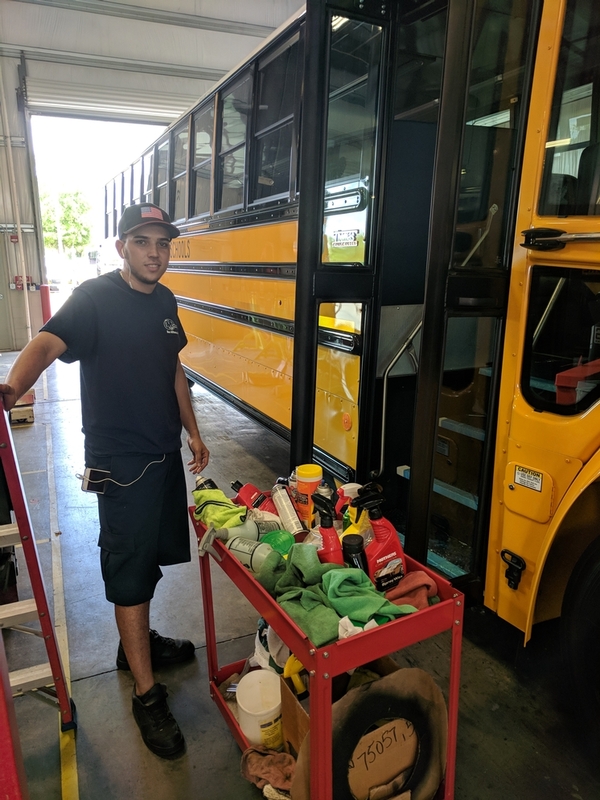 Prior to delviery the buses were properly pre-delivery inspected and detailed at Matthews Bus Alliance, Orlando, by EPi Martinez’s PDI Techs and Chris Alfonso’s detail TEAM. Thanks for choosing Matthews, Pasco County! 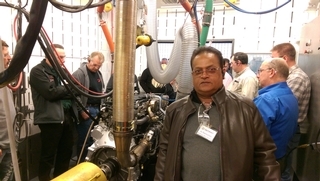 Ali Rampartab attended the 2019 Thomas Built Buses Train The Trainer event at the Detroit Diesel Plant March 12 - 15th, 2019. The training was about Detroit Components, Functionality, Manufacturing Process, Assembley Process of parts on to the engine block and cylinder head. It covered installation of electrical harnesses, fuel, oil and coolant components. The process included building DD5 & DD8’s from a bare cast block to complete running engines. Each DD5 and DD8 engine is put through Dynamometer testing checking for coolant, engine oil, fuel leaks, vibration, noise level, & horsepower ratings. Both DD5 & DD8 engines are being built with 2027 EPA Regulations in mind with little or no change to components required. Ali will be overseeing and providing Detroit Diesel training to Florida Customers and Team Matthews Technicians. Ali was once again recognized as Platinum Trainer for TBB yet again notching another Diamond on his ring. This means last year’s Southeast Trainer of The Year will once again be in the running for Southeast and National Trainer of the Year at the upcoming Thomas Built Buses Annual Dealer Sales Meeting. Good luck Ali! 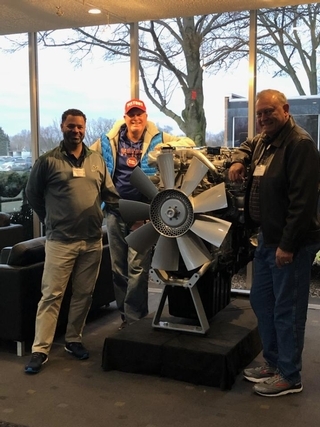 Jason Harris, Director of Transportation, Manatee County, and Arby Creach, Director of Transportation, Osceola County, visit the Detroit Diesel Plant with Bob Dolan, Business Development Manager, Matthews Bus Alliance. 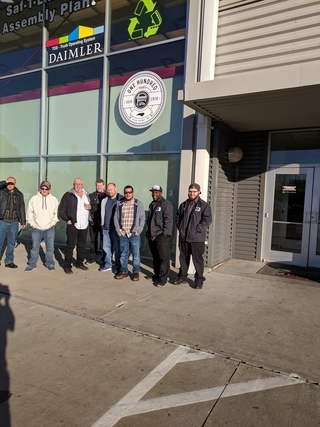 Detroit Diesel Factory in Detroit MI with Matthews Bus Alliance Account Manager, Cliff Clare Jr.
years of testing is now being introduced into the Florida School Bus Market exclusively in the Thomas Built Buses Saf-T-Liner C2. 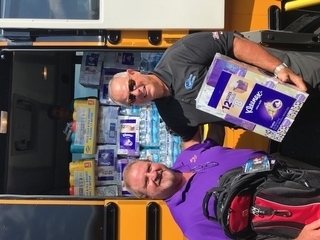 Click on PDF below to read a very nice letter from Arby Creach, Director of Transportation, Osceola County District Schools, FAPT President, regarding Team Matthews services. Donald Carter, the Transportation Director for St. Lucie County Distict Schools, meets with Tim Bevier, the Account Manager for Matthews Bus Alliance, at the South County Bus Compound in Port St. Lucie. Click on URL below to see St. Lucie Seon Testiminial Video. Sure love all the Thomas C2’s in this video. Thank you for Choosing Matthews St. Lucie County! Click on the link below to see what one amazing Lake County District Schools student is doing about illegal school bus passings by motorists. We just received our 2018 Thomas Built Buses Dealer Scorecard and WOW! Our team scored 158.5 points which is 8.5 points higher then what is needed to achieve the highest Platinum Level status and .5 away from perfection considering all bonus points available. Great Job TEAM! Everyone at TEAM Matthews Florida is excited about receiving this award at the upcoming Thomas Built Buses National Sales Meetings in April. We are bringing our 2018 Employee of the Year, Rena Hafeez, Ali Rampartab, and the sales team with us this year to celebrate. Everyone at TEAM Matthews wishes to thank our great customers for "Choosing Matthews!" 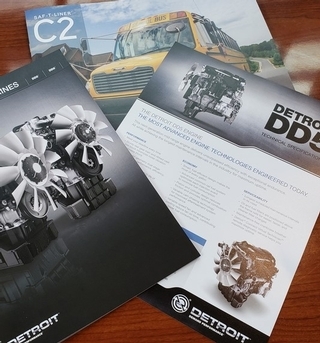 Ask your MBA Accout Representative for the ALL NEW 2019 Thomas Saf-T-Liner C2 and Detroit Diesel DD5 Brochures. 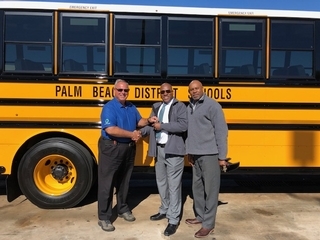 Collier District Schools Fleet Manger, Michael Huff accepts the keys from Matthews Buses Florida, Account Manager, Cliff Clare Jr., of their 39 new 2020 Thomas Built C-2 77 passenger and Wheelchair accessible buses. Collier District Schools operates 355 buses on a daily basis. These buses were also equipped with Integrated Child Seats and a new driver safety device called Mobileye. This is a new product that gives the driver information of pedestrian, lane departure, speed limits, vehicles relative speed in front of them in a passive format designed to enhance driver situational awareness. The buses also are equipped with TM-43 Air Conditioining Compressors and a completely self contained dash AC system. Thank you Collier County for Choosing Matthews! 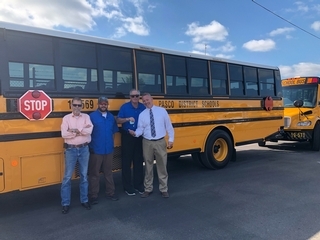 On 28 February 2019, Randy Fabal (Director of Transportation, Monroe District Schools) accepted the keys from Matthews Bus Alliance Account Manger, Cliff Clare Jr., in Key West, Fl., for their four(4) new 2020 Thomas Saf-T-Liner C2 buses, one of which is a wheelchair accessible bus. The Districts Fleet of 63 buses not only serves the Schools of the district but also serve an intricate part of Monroe Counties evacuation plan during times of emergency which they did prior to the arrival of Hurricane Irma, 1.5 years ago. The buses evacuated hospitals, nursing homes and others need during the evacuation of the keys during that horrific event. 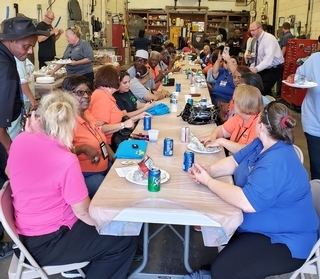 Matthews Bus Alliance, Inc., hosted a potluck lunch for Love the Bus Month at our Orlando location on Valentines Day 2/14/19. 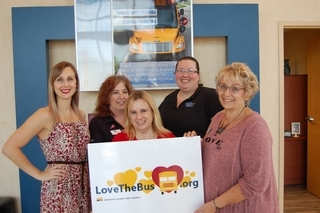 Pictured from left to right are: Kristin Radesca, School Bus Sales Coordinator, Christie Andrews, Sales Admin, Christine Stogner, Commercial Sales Admin, DeAnne Martin, " The Voice of Matthews," Assistant to the President, and Peggy Zunk, School Bus Order Admin. Adriana Pratts, Dona Harden and Kevin O’Gorman (CFO). Roland Ferguson, Johan Montoya, and Steven Salinas = BEST TEAM EVER! 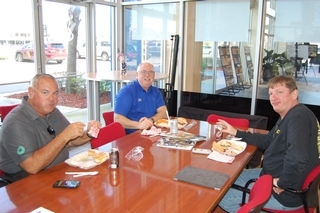 Cliff Clare, Jr., Matthews Bus Alliance Account Rep, Jim Crowcroft, National Sales Manager -Thomas Built Buses, and Richard Shively of Thomas Gulf Coast in Houston, TX meet for lunch at our Orlando location during our Love the Bus Event. 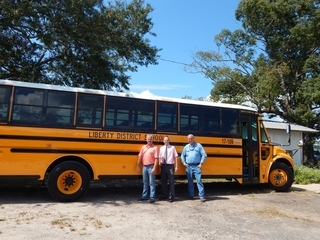 Robert Borsky and Christie Secone, Managers of Transportation Services, Pasco County District Schools, pictured with Bob Dolan, Business Development Manager, and Glenn Matthews, Owner, Matthews Bus Alliance, Inc., in front of one of their 40 new 2020 Thomas Saf-T-Liner C2 School Buses powered by the ALL NEW DETROIT DIESEL DD5 Engine. Robert and Christine were at Matthews Bus Alliance, Inc., Orlando location 3/6/2018 to inspect, test drive, and select final placement of the camera’s on their new buses. Delivery of these new buses is anticipated in the next couple of weeks to Pasco County. These 40 buses will be the first DD5’s to be put into service in the state of Florida. The DD5 offers improved fuel economy, 400K B10 Life, and 35,000 mile service intervals. The DD5 will offer districts lower total cost of ownership, less re-gens, Virtual Technician, and easy access to TEAM Matthews Mobile Service. Everyone at TEAM Mathews wishes to thank Pasco County for Choosing Matthews and Demanding Detroit! 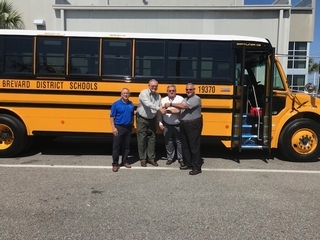 Arby Creach, Director Transportation, David King, and staff accept first of 40 new 2020 Thomas Saf-T-Liner C2 school Buses. Matthews bus is proud to have received 100% of Osceola’s bus order this year. Glenn Mathews, Bob Dolan, and Tim Bevier were on hand to thank the county for trusting our service and partnership. Thanks for Choosing Matthews Osceola! 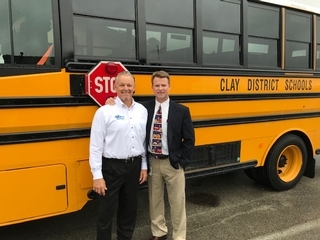 Derald Sweatt, Transportation Director, Clay County District Schools, takes delivery of 14 brand new 2020 Thomas Saf-T-Liner C2 ESE Buses from Tim Bevier, Account Representative, Matthews Bus Alliance, Inc. Thanks for Choosing Matthews, Clay County! Rifled Air Conditioning Team in front of 2020 City of Lauderdale Thomas Built Buses Saf-T-Liner C2 with Cummins Engine that we manufactured and installed a 3 compressor AC System with 2 In wall Evaporators, (1) Independent Dash AC System, 2- 3 fan skirt mount condensers and standard 6 year Fl warranty. Great Job TEAM! AC For Florida Customers Like No Other! 55k more BTU’s! 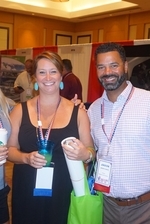 At the 2018 Mid-Year Directors Meetings, Florida Directors, (courtesy of Matthews Bus Alliance, Inc.), had the opportunity to meet Caley Edgerly, President of Thomas Built Buses. Caley provided a Manufacturers’ Update while receiving valuable feedback concerning the many technologies available from TBB’s parent company, Daimler. Based on customer feedback, Thomas chooses which useful and affordable technologies to offer in the buses they build, like "Mobile Eye." On January 23, 2019, TEAM Matthews hosted a special Open House to "Kick Off" the FAPT Mid-Year Directors Meetings, which took place in our hometown of Orlando. "Jouley," The Electric Bus, the NEW Detroit Diesel DD5, Cummins CNG, and Diesel powered C2’s, were on site and available for customers to touch, feel, ride, and drive. Factory representatives from Thomas Built Buses, Rifled Air Conditioning, Seon, AngelTrax, Syntec Seating, Zonar, Cummins, Detroit Diesel, Freightliner, Bus Parts Experts, Daimler Truck Financial, The Braun Corporation, and others were on hand to assist customers. A two person acoustic band provided entertainment, as customers and DOE personnel toured the facility while TEAM Matthews was in action. Attendees witnessed firsthand the care that goes into every PDI and DOE inspection. 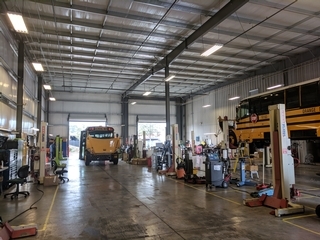 Osceola County’s 40 new Thomas C2 buses were in the process of being prepared for delivery in the dedicated inspection bays. Each Platinum Support Certified Service Bay features its’ own set of hydraulic lifts, which are essential to completing a proper FL PDI/DOE inspection. Customers left impressed with the facility, our people, and what is NOW the Platinum standard for new school bus deliveries. 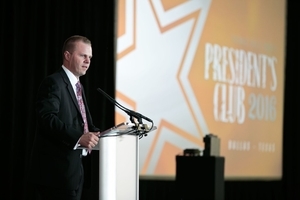 "Being Platinum Support Certified makes hosting these types of special events pretty easy for us. Other than the band, food, and vendors, we operate this way on a daily basis," said Glenn Matthews. 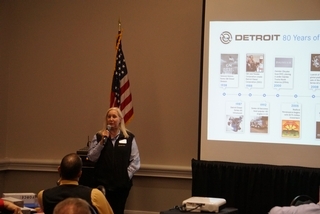 At this year’s 2019 FAPT Mid-Directors Meetings, we introduced Pamela Esshaki, Assembly Quality Coordinator, and Doug Weatherly, National Sales Manager for Detroit Diesel Corporation, to provide our 2019 Manufacturers’ Update. Pam told her life story, which received rare applause from the audience, as she was the first ever female employee post-World War II, to work in the Detroit Diesel factory. Imagine for a moment her environment and experiences in a heavy duty diesel engine factory, back in 1974. Pam spoke of her battles to get a women’s bathroom installed in the factory. She spoke of the days when Roger Penske took over the company, and when he chose to sell it for the best interest of the long term future. Today it is "HER PLANT," with many other women employed on the production line. Pam and her team personally ensure the quality of every DD5 engine built there. This editorial is much too short to highlight all the features and benefits of the ALL NEW DD5, and how it’s built. We encourage customers to take Pam up on her offer to provide them with personal plant tour. Every DD5 that hits the road will do so only after it is completely dyno tested at the factory. Detroit is the only manufacturer to do this on every single engine produced. Others may test one out of a thousand! The technology in this plant is astonishing and cannot be fully appreciated until seen in person. 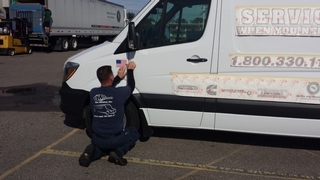 Scott Nagy, road tech extraordinaire’s new Freightliner Sprinter Mobile Service Van gets graphics before hitting the road to support our great customers. 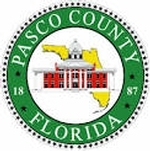 Scott will soon be lettering several school buses donated by Pasco County to Bay County to help them with the aftermath of Hurricane Micheal. Team Matthews is supplying the lettering and installation to Bay County. Scott is so excited to hit the road in his new van. This mobile service van is #16 of our fleet to support our great customers like no others can. Ali Rampartab poses with Orange County Public School Technicians who he provided C2 Electrical Troubleshooting, Emissions, Multiplexing, and Diagnostic Training. OCPS has 650 Thomas C2’s in service every day that their technicians service. Palm Beach District Schools receives the 31st and 32nd of 60 Thomas Built Buses C-2’s ordered in 2018. 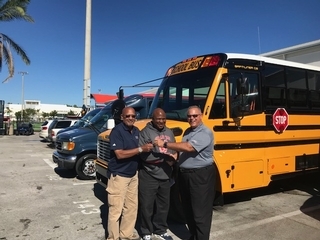 Pictured are Shane Searchwell, (center) Director of Transportation, and Carl Boucard, (right) General Manager Fleet, receiving the keys from Matthews Buses Florida account Manager-Cliff Clare Jr. "Thanks for Choosing Matthews," Palm Beach! Rifled Air Conditioning Systems has opened its’ new paved, lighted, and fenced parking lot located on Fairfield Road in High Point, NC behind the RAC factory which is on Earlham Place. 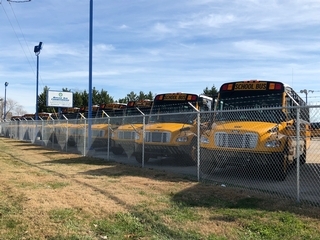 The lot was acquired to park buses awaiting AC installations and shipping to customers. This additional parking space will allow RAC greater flexibility in serving customers needs. Thomas Built Buses - Why We Do This! Levy District Schools received their 2019 Thomas C2 Saf-T-Liner buses this week. The buses feature roof top AC systems from RAC! The staff was on hand to receive the latest order. In the photo left to right are Fleet Technicians Marcus Glover, Eathan Bray, David Fisher, and Jarrod Houser, also Gary Masters (Director of Transportation), Pete Fenderson (Mattthews Account Manager), Joseph Wain (Training Supervisor) and Tina Young (Administrative Assistant). Also on site was Matthews’ Technician Rapid Response Team Member, Scott Nagy who made some final adjustments. Thank you to Levy District Schools for the continued relationship and allowing Matthews Bus Alliance, Inc. to provide buses, parts, service, and training for your transportation needs. From everyone at TEAM Matthews, "Thanks for Choosing Matthews!" Amy Neal, of P.K Yonge Developmental Research Center at University of Florida accepts delivery of their brand new 2019 Thomas C2 from Tim Bevier, Account Representative, Matthews Bus Alliance, Inc. "Thanks for Choosing Matthews," P.K Yonge! 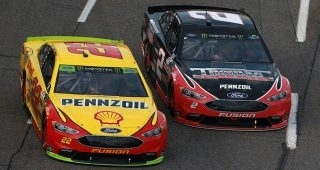 The Thomas Built Buses # 2 NASCAR Ford, driven by Brad Keslowsi, finished 5th at Martinsville after running up front most of the day. Attention: NASCAR/Thomas fans, the Die Cast Metal replica of this car is available to purchase. Contact your local account representative for more information. 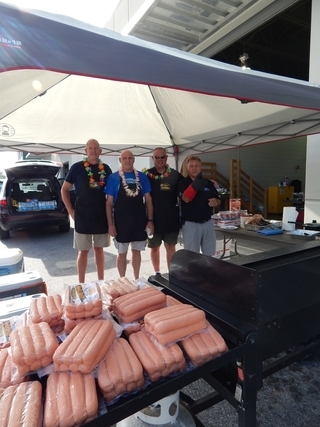 Team Matthews joined the Alachua County District School Transportation Department, October 18th, 2018 in Gainesville, FL for an awesome Hot Dog Cookout, Compliments of Matthews Bus Alliance, Inc. Bob Dolan (Business Development Manager), Tim Bevier, (Account Representative), Brad Hull (Mobile Parts Representative), Ron Vaughn (Road Technician Extraordinaire), and Glenn Matthews (Owner, Dealer Principle, President), joined David Deas, Transportation Operations Manager, Reginald Thomas, New Director of Transportation (Congrats! ), and Paul White, Assistant Superintendent, to honor and serve the staff, drivers, and mechanics. 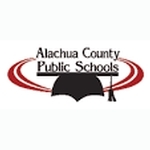 Everyone at TEAM Matthews is excited to have Alachua County as a new bus buying customer. This is the first time Alachua County has purchased Thomas Built Buses since TEAM Matthews came to the great state of Florida in 2008. We all enjoyed a beautiful day supporting these great transportation professionals and we look forward to delivering and supporting their new 2020 Thomas Saf-T-Liner C2 Buses soon. "Thanks for Choosing Matthews", Alachua County! 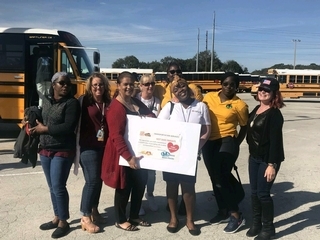 Matthews Bus Alliance is proud to have supported Osceola District Schools Transportation TEAM’s celebration of National School Bus Safety Week. 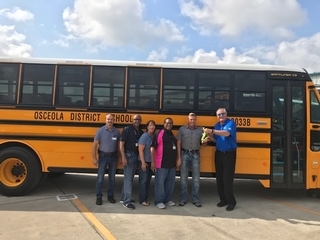 "Our thanks again to Glenn, Lori, Bob,Tim and your entire TEAM for the outstanding support of National School Bus Safety Week, the Osceola Transportation Team, and all 26,000 students we transport each and every day." Pictured is Bay County School Bus Garage. 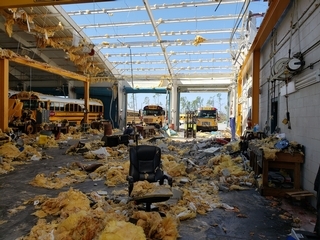 North Florida Panhandle School Transportation facilities were hit hard by Hurricane Michael. 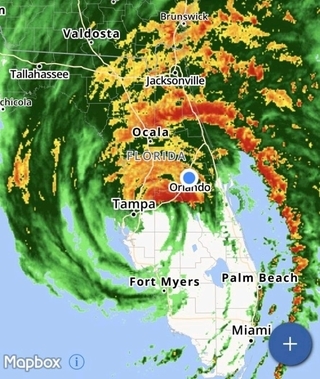 Everyone at TEAM Matthews has the transportation professionals, children, families, teachers, administrators, and all those impacted by Hurricane Michael in our thoughts and prayers. "We as a TEAM are doing our best to help wherever we can," Glenn Matthews. This photo was take by James Manning, MBA Road Service Technician while at Bay County, Tuesday October 16th, while on site hoping to help out. James, Scott Nagy, Pete Fenderson, and Brad Hull have been traveling the area offering whatever assistance they can. Everyone at TEAM Matthews Florida is excited that Pasco County, Alachua County, Flagler County, and Lake Wales Charter Schools have chosen TEAM Matthews. 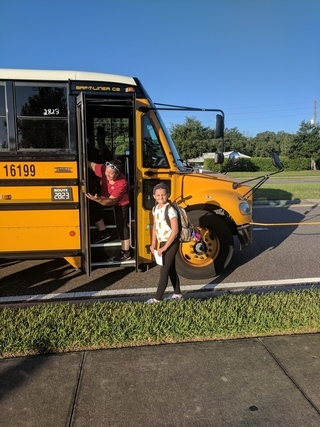 Lake Wales Charter buses were delivered already this summer in time for school start and the others will be delivered throughout the year this year. We welcome these new accounts to our family of customers statewide. Thank you for choosing Matthews! The Daniel Group (Independent Auditors) routinely survey Thomas Built Buses Customers for several key areas of customer satisfaction with the product and services provided. As of 10/10/2018, Matthews Buses Florida, ranks 2nd among All Thomas Dealers Nationwide. The worst reported score for MBA in FL was a 9 out of 10! Customer stated that "the dealer has their business model built around their service and their competitors (Bluebird and International) can’t begin to compete with them. He added that the owner and his wife are personally involved with them, immediately follow up on anything they need, and their service technician comes right away (and often) whenever needed (sometimes he’s onsite every day). He stated that the dealer provides onsite repair and service without him having to do anything. The customer stated that the dealer really makes it easy on the customer. 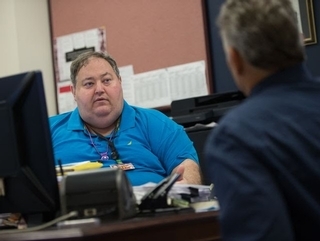 He added that the dealer goes the distance to ensure that they get everything they need." Pete Fenderson, MBA Account Rep, and Dave McAvoy, Daimler Truck Financial, will be presenting to attendees 10/4/18 on how to purchase tomorrow’s buses with Today’s money using "NO DEBT," Financing thru Daimler and calculating long term life cycle costs. Tim Bevier, Matthews Account Representative, on hand to deliver new 2019 Thomas Saf-T-Liner C2’s to Mark Cochenhour, Director of Fleet Services, Norman Denig (Pictured) and Terence O’Leary, Director of Operations/Business Services (Not Pictured). The 2109 Thomas Saf-T-Liner C2 buses feature Syntec Integrated 3 Point Harness SC3 Seats throughout, Rifled Air Conditioning 3 Compressor Systems, Seon Cameras, Braun Lifts, and much much more. Thank you St. Lucie County for "Choosing Matthews!" Tina Creech was named the first ever "Cheryl Phillips," Rifled Air Conditioning Systems, Employee of the Year. Cheryl Phillips, a valued team member and friend to all at RAC for the past 10 years past away suddenly this year . Cheryl and Tina worked closely together every day for the past 8 years and were good friends. Anyone who knows RAC, realizes how important Tina is to the company and how loved Cheryl was by everyone. Tina has been exceptionally strong for everyone in Cheryl’s absence. Cheryl’s son Zach works for the company and carries on the Phillips family legacy. Pictured are Dean Minor, General Manager, and Tina Creech. 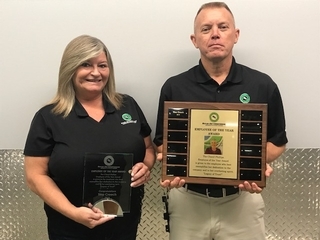 Everyone at RAC and Matthews Bus Alliance, Inc., wishes to congratulate Tina for being named the first recipient of this special award to be given annually to the employee who exhibits the work ethic and humanity that is now the Cheryl Phillips legacy at Rifled Air Conditioning Systems. 2018 MBA Employee of the Year! Reena Hafeez was presented the 2018 Matthews Bus Alliance "Donnie Helm" Employee of the Year award at our Annual Employee of the Year Luncheon, September 19th, 2018 at our facility in Orlando, FL. Most of TEAM Matthews Orlando was in attendance to congratulate and celebrate Reena’s accomplishments. Everyone was treated to lunch from a local food truck service and shaved ice for desert. Fred Murphy, retired Director of Transportation and Assistant Superintendent Polk County Schools, offered a very inspirational speech to us focusing on loyalty. Fred certainly was a loyal customer of ours while at Polk County. He talked about how we as individuals and as a company earned that loyalty every day with our honesty and integrity. What we like to call "Our Legacy of Trust!" Everyone really appreciated Fred taking the time to speak to us so openly now that he is retired. It’s nice to know that these values matter to customers. Special loyalty gifts were given to employees by Glenn and Lori based upon years of service to MBA and our great customers in Florida. This being our 10th year of being in Florida, those with us since 2008 were given special engraved MBA watches. Thank you to Volusia and Lake County District Schools key personnel for being in attendance to help celebrate Reena’s accomplishments as Employee of the Year and our 10 Year Anniversary. Reena has worked in Florida with Lori and Glenn Matthews for the past 10 years in warranty. She does an amazing job supporting customers by filing claims for them with the various manufacturers. She is an unsung hero who shows up to work every day on time with a smile on her face and does a fantastic job for everyone. This truly was a special moment for all. Most importantly, Reena is the proud parent of 2 Salutatorians and the 2018 Valedictorian at West Orange High School here in Orange County, FL. Obviously Reena is a "class act" all around. Congrats Reena from everyone at TEAM Matthews for being named the 2018 Matthews Bus Alliance Employee of the Year! 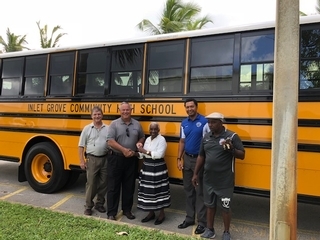 Dr Emma Banks and staff take delivery of the first new bus Inlet Grove Community High School in Rivera Beach, FL has ever had from MBA Account Manager Cliff Clare Jr. Thank you for choosing Matthews, Inlet Grove! 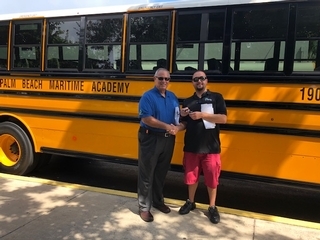 8-Thomas C-2’s being delivered to Director of Transportation, Daniel Barone of Palm Beach Maritime Academy by Matthews Bus Alliance, Inc., Account Manager, Cliff Clare Jr. These are the first new buses ever delivered to the school. Thanks for "Choosing Matthews" PBMA! Matthews Buses Florida Turns 10! The commitment to the mobile service program is evident in the 15 vehicles their techs operate and their appearance, training, and qualifications. TEAM Matthews is constantly adapting and gearing up to meet the needs of its customers. If you haven’t experienced their "local everywhere" service, you really don’t know Matthews! Now with the NEW Detroit Diesel DD5 engine available as an option on the Thomas C2, Matthews is gearing up to provide exceptional warranty, parts, service, and training support ON SITE, "The Matthews Way!" The fuel and service mileage advantages of this diesel motor alone warrants a closer look. Daimler fully expects this motor to follow the success of its heavy duty DD15 predecessor by dominating the medium duty bus market. As part of Matthews’ Platinum Support Certification Commitment, they continue to reinvest in the dealership, employees, community, and customers. Over the past year and a half, since breaking out on their own, The Mathews’ have reinvested hundreds of thousands of dollars into the dealership and Rifled Air Conditioning to improve the overall customer experience. When visiting the dealership and RAC there is no questioning the commitment made to Florida school bus customers. 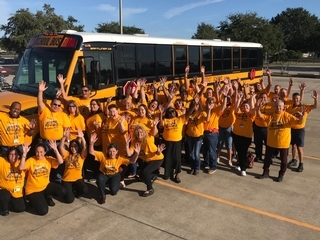 As TEAM Matthews embarks upon the next decade, as a FAMILY, they do so with confidence in their unique ability to adapt based upon its’ commitment to Florida Bus Customers and amazing employees. Lori and Glenn wish to thank all their GREAT Florida Customers for "Choosing Matthews!" Manatee Video Features 2019 C2’s! 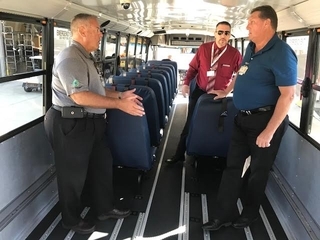 See link below for ABC News Story featuring Jason Harris, Transportation Director, Manatee County District Schools, and their "First Class" 2019 Thomas C2 Buses. Today 8/8/2018 Desoto District Schools performed the yearly Back to School In Service symposium. 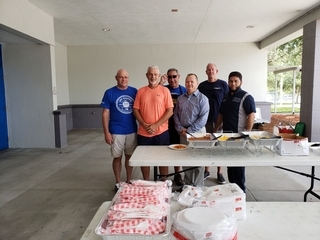 Matthews Buses Florida was invited to not only a Great Hot Dog Lunch with all the fixings but also "face to Face " question & Answer period with the MBF Staff of Jeff Slack and Brad Hull of the parts dept, Roberto Gonzales of the Service Dept and Cliff Clare Jr the Account manager. Jeff Slack, Randy Faul, Desoto Fleet Mgr, Cliff Clare Jr., Robert Smith, Desoto Transportation Director, Brad Hull and Roberto Gonzales. 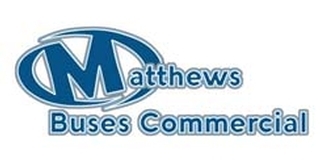 Matthews Buses Commerical a division of Matthews Bus Alliance, Inc., has a new web site. Check it out below. 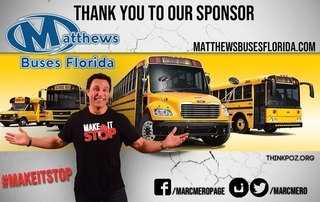 Matthews Bus Alliance, Inc., sponsored Mark Mero’s "Think Poz" Motivation Tour August 2nd, 2018 for Polk County School Bus Drivers’ Orientation. 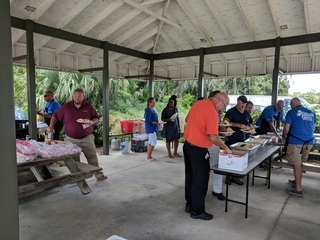 We also participated in the annual Hot Dog Lunch for the Transportation Drpartment and Staff/Technicians at the Bartow Garage Location - 8/6/18. See Video below from Mark Mero’s Presentation to Polk Count School Bus Drivers at Victory Lakeland. 8/2/18 Mark Mero Presented an uplifiting presentation to the Polk County School Bus Drivers compliments of Matthews Buses Florida. See Video Link Below! A new addition to our fleet of 15 Mobile Service Trucks located state wide. Pictured - Local graphics folks putting the finishing touches before this 2019 Freightliner Sprinter is commissoned into service for our great customers. 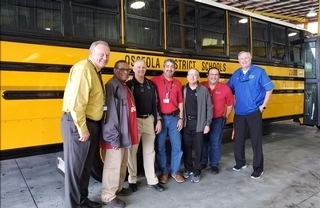 Bob Dolan, MBA Business Development Manager, presents keys to Osceola District Schools, NEW 2019 Thomas Saf-T-Liner C2 School Buses to Shawn Tucker, David King, Greg Roberson and staff. Osceola’s new C2’s are equipped with Rifled Air Conditioning Systems and Standard Braun Wheelchair Lifts. Everyone at TEAM Matthews appreciates Osceola ""Choosing Matthews!" C2 Pine Box Derby Champ! This is where it all started. At the beginning Parker needed to figure out what type of car to make. Parker was going to run in the Pine wood derby with his Trail Life troop 9613 located in Malabar Florida. The theme was space. Parker was not into space ships or other space craft’s so this was a hard thing for parker to do. However the boys in the troop are encouraged to be creative with their cars. This pretty much allows the boys to make whatever they want. Parker told me he wanted to make a C-2 bus. I was surprised by this. I tried throwing ideas out there but parker was locked in to the bus Idea. Parker was fixed on the C-2 Thomas bus. Parker has always had a liking for the Safety liner school bus and likes to reed information on Thomas buses. One afternoon when I got home from work Parker was standing in the driveway holding a die cast model of a C-2 bus. Parker had saved up his money from doing odd Jobs around the property that we live on. With this money he bought the die cast model of the bus. Parker explained this was the bus he wanted to make for the pine wood derby. For several weeks now parker would work on this block of wood to shape it and paint it to create the C-2 bus for the pine wood derby. March 17th 2018 was the big day. Parker was excited to run the bus. Parker was competing with the Hawks. This is the level he is in with Trail Life USA. 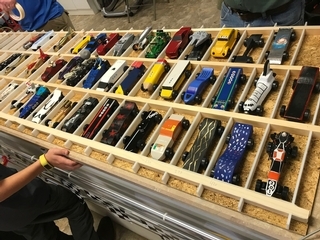 There were several cars in the lineup area that the Boys with trail life had created at home. All the boys in trail life did a fantastic job with their cars. We have a group of very creative kids in our troop and we are very proud of them. Parkers bus ran several times down the track. He started out holding second place. Then was holding first place with the last couple runs down the track. Parker received an award for 2nd place Hawks in troop 9613. Parker and Dad are very proud of parkers creation and accomplishment. I have attached a couple pictures of parker and his C-2 bus. Matthews Bus Alliance has maintained a Net Promoter score for the past 12 months of 93.3% Thank you to our great customers for giving us such high marks and to our PDI/Detail TEAM in Orlando. Great Job TEAM! Customers can trust that we will continue to improve with a goal of 100%. 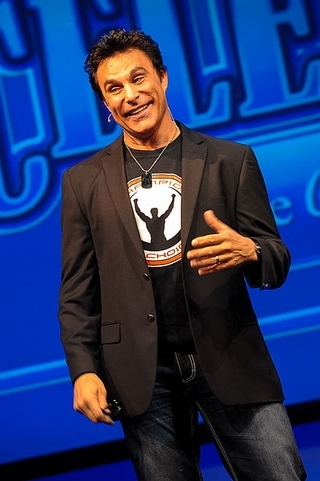 Mark Mero is set to appear at Collier County Transportation "In Service" Date August 9, 2018 courtesy of Matthews Bus Alliance, Inc. Glenn and Lori Matthews, freinds with Mark and his wife Darlene are proud to sponsor him at events throughout the state. Mark shares an upstate NY heritage with Glenn and Lori. 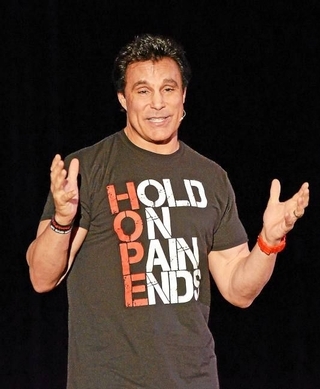 His career and life story are an inspiration to anyone who experiences his presentations. For more information on Mark and his presentations click on the link below. Congratulations to Fred Murphy for receiving the much deserved Pioneer of The Year Award at the recent FAPT / SEPTC Annual conference. Fred’s speach was very inspirational to the Transportation Professionals in attendace . Everyone at TEAM Matthews is proud that Polk County chooses Matthews! A tradition dating back to Fred’s leadership during his tenure as Assistant Superintendant. Fred mentored many of the Directors in attendance. Arby Creach being one of them and is now the Director at Broward County District Schools and FAPT President. Arby presented this special award to Fred along with Jim Beekman, another Fred Murphy mentoree, and now Director for Hillsborough County District Schools. 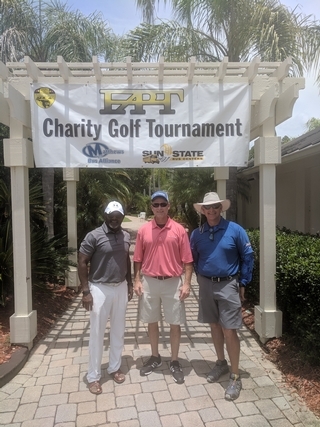 Matthews Bus Alliance was proud to sponsor the FAPT Charity Golf Tournament along with Sun State International this morning. Pictured are Tim Bevier, Daryl Sweat, and Reggie Thomas. Fun was had by all and money was raised for FAPT charities. Great work Bob Dolan, MBA, who chaired the tournament for FAPT. Matthews Bus Alliance is proud to be a Major Supporter and Sponsor of this year’s FAPT and Southeastern States Conference starting with the Golf Tournament Sunday Morning. 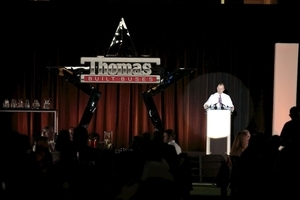 Then the Major event hosted with Thomas Built Buses Sunday Night. The Pirates Bash Monday Night and off site Hospitality/Music/Food and Beverages Monday and Tuesday nights with luxury shuttle. No surprise that at Team Matthews, we believe in fully supporting our great customers by giving back to FAPT and Southeastern States as one of the Big Three Major Suppliers. We also have a special keep sake memorable gift ( Logo Turvis Tumblers) for all attendees. RAC and Bus Parts Experts welcome all Southeastern States attendees as a participating sponsor with us in all events. 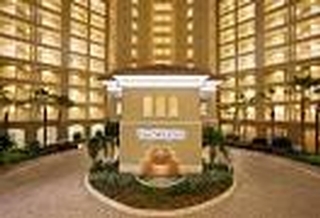 We look forward to seeing everyone at Saddlebrook Resort in PASCO County for some fun and good professional interaction. Review information below (link) about the all NEW very exciting DD5 Engine coming this summer. Service and Training from TEAM Matthews at your location! Below are the specifications for the TM-21 and TM-16 compressors. FACT: All AC systems offered by Matthews Bus Alliance on FLDOE ITB: 2017-02 feature (2) TM-21 compressors with a capactiy of 65,000 BTU’s each. Thus total capacity of BTU’s = 130,000. 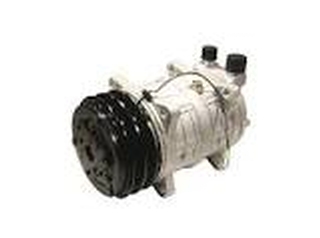 We also feature a 3rd compressor = TM16 = an additional 55,000 BTU’s over our competition for total BTU capacity of 185,000 BTU’s. NO WONDER RAC SYTEMS WORK BEST! Adding Evaporators without the compressor capacity to drive them simply circulates more air! All Rifled AC Systems offered on FLDOE ITB: 2017-02 are warrantied for 6 or 7 Years - STANDARD! 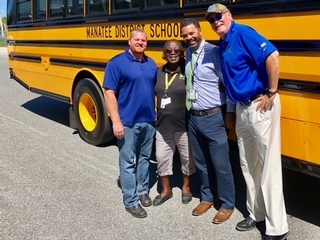 Arby Creech, Transportation Director (FAPT President), and Randy Wheeler, Fleet Director, Brevard County Schools visited Matthews Bus Allianace, Inc., to inspect the first of their 42 new Thomas 2019 Thomas Saf-T-Liner C2 Buses. The lift buses were equipped with the STARS seating system. All buses feature Rifled Air Conditioning Systems and some included the TM43 Compressor in addition to the independant Dash A/C System from Freightliner. Matthews Bus Alliance is the only dealer who offers chassis factory independant Dash AC with the TM-43 compressor and a 6 year warranty! Everyone at TEAM Matthews wishes to thank Brevard County for "Choosing Matthews!" 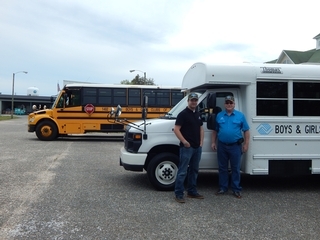 The Boys and Girls Clubs of the Emerald Coast recently received two more 77 Passenger Thomas C2 Saf-T-Liners and on Good Friday received A Thomas Minotour Type A Multi Function School Activity Bus (MFSAB). 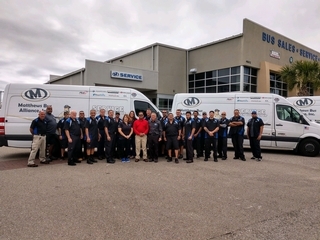 Thank you to BGEC for continued confidence in our product lines and unmatched service departments. Shown in Matthews Buses Florida hats receiving the MFSAB are Tom Locklier (blue shirt) and Bryce Hines (Black Shirt). Tom is a great "Team" leader with a get it done attitude. Thanks for "Choosing Matthews," Boys and Girls Club Emerald Coast! 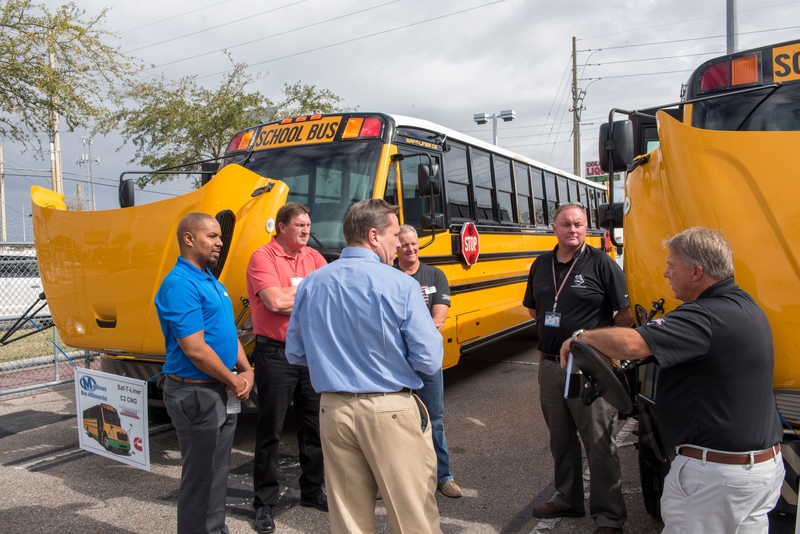 At TEAM Matthews, We strongly encourage FL School Bus Customers to visit its’ bus suppliers to inspect new buses in advance of delivery and to see what’s the the commitment level from the dealer to you as a bus customer. Everyone at Matthews Bus Alliance, Inc., is grateful to Volusia County for "Choosing Matthews!" Congrats MBA for Platinum Re-Certification! 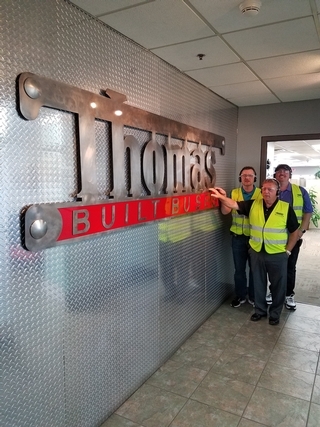 A on site Thomas Built Buses Platinum Support Re-Certification audit was conducted at Matthews Buses Florida in accordance with program requirements on April 25, 2018. Initial certification occurred March 29, 2017. Based on this assessment, Matthews Buses Florida has successfully maintained compliance with the 124 Platinum Support performance requirements and is recommended for re-certification. "Chris and Team - Congratulations on your successful re-certification!!! This is no small achievement and your efforts and accomplishments were highlighted on the auditor’s report. There were many positives listed by the auditor for which you can all be proud! Once again congratulations!!!" positively contributes to the foundation for building strong customer relationships. 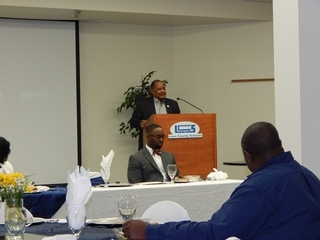 Matthews Buses Florida was proud to participate in an appreciation luncheon for Dr. Michael Moore of Leon District Schools. 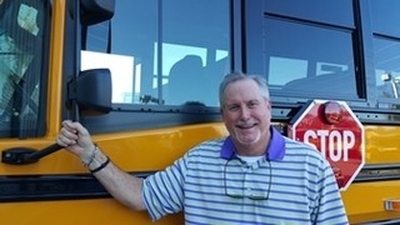 Dr. Moore has served 11 years as Transportation Director and under his leadership the Department transitioned to Natural Gas Fueled School Buses. Dr. Moore will move on to another challenge within the District until retirement in two years. Matthews Buses Florida is proud to have worked with Dr. Moore on the Natural Gas Project and provide "best in class" support and vehicles. We will miss our business partner and friend. Dr. Moore leaves Transportation in the hands of Manny Joanos who has been a leader in several capacities serving the public as a Commissioner and within Leon District as well as private business. Mr. Joanos is a visionary who brought the Alternate Fuel Programs to the "Capital City" saving the taxpayers money while cleaning up the environment. The district entered into a public private partnership with NOPETRO for the implementation of fueling stations in Leon County. 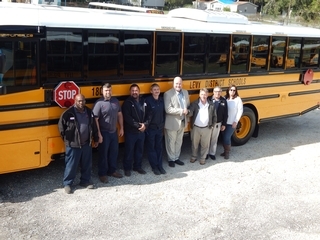 The partnership afforded the district the ability to implement the infrastructure necessary to support the schools CNG fleet as well as their county white fleet. The fueling stations are open to the public which further reduces the districts overall fueling budget. The partnership is a model for other districts statewide looking to choose CNG. Matthews Bus Alliance, Inc., will have its’ second CNG Thomas Saf-T-Liner C2 Demo available this summer for FL districts to see. It features a Cummins Powered CNG Engine, Allison Transmission along with the RAC 3 compressor best in class AC system. Ali Rampartab Southeast Trainer of the Year! 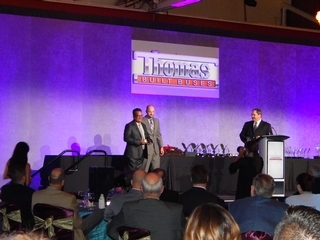 Ali Rampartab was once again named, Thomas Built Buses Southeast Region, Trainer of the Year, at the Thomas Built Buses International Sales Meeting held at the Gaylord Palms Resort located in Kissimee, Fl. Since this years meeting was local, Ali’s family was on hand to see him receive this honor. Ali is the most decorated trainer of all Thomas Built Buses Dealers. Next time you see Ali, please congratulate him and ask him to show you his ring. Everyone at Team Matthews Fl is so happy to have Ali on our TEAM. His training and guidance benefits so many of our customers technicians and our technicians as well. His training ecompasses everything on Thomas Built Buses including Rifled Air Conditioing. MBA makes Ali availbale for free to our great customers. Great Job Ali, we are all so proud of you! Congratulations to Tracey Tolby for being named the overall Trainer of the Year. 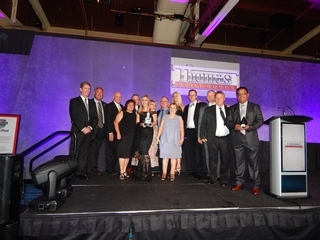 Matthews Bus Alliance, Inc., was once again awarded the prestigeous "Platinum Award" during the President’s Club Dinner, April 21, 2018, at the Thomas Built Buses International Sales Meeting held at the beautiful Gaylord Palms Resort, Kissimmee, FL. 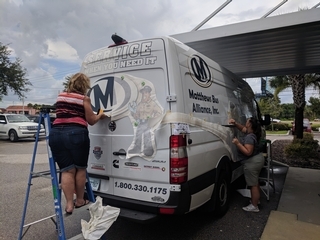 Team Matthews was proud to be the host dealership and were responsible for making sure all the show buses were detailed. Out of a possible 150 points, MBA scored 153 points due to bonus points earned by the dealership. 2017 represented the largest delivery of buses by far in Matthews Buses Florida 9 year history. 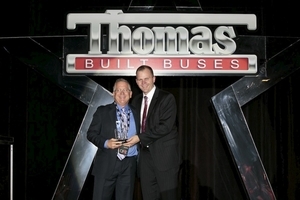 Congratulations to New England Transit for being named Thomas Built Buses Delaer of the Year! An honor, we at Matthews Bus Alliance, Inc., hope to one day win. Thank you to all of our customers for "Choosing Matthews" which earned us this status with Thomas Built Buses. A highlight of the weekend was guest speaker Bill Lambier who was a standout NBA champion with the Detroit Pistons. His presentation kicked of the introduction of Detroit Diesel DD5 engines available to order in Thomas Built C2’s this summer. The DD5 will provide impressive performance, durability, 35,000 - 45,000 mile service intervals, lower regens, and most importantly significant better MPG to Fl customers! Bill Lambier is now a coach in the WNBA which lead us into a discussion on the importance of hiring women in the male dominated bus delaership world. Matthews Bus Alliance, Inc., is so very proud to have several women in highly important positions in our company including operations, administration, sales, service, and warranty managment. We all came away from this weekend with more knowledge and motivation to continue to strive for constant improvment for our great customers. We try to see things from our customers eyes! Customer Focused, Customer Driven! 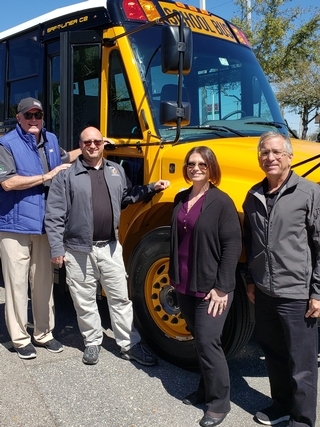 Bod Dolan presents one of 10 new 2019 Thomas Saf-T-Liner C2 buses to Manatee District Schools, Jason Harris (Transportation Director),Josh Wanbaugh (Fleet Maintenance Director), Velma Mooney (Driver Trainer). These are the first C2’s delivered to Manatee County since 2012. Thank you for choosing Matthews Manatee! Every Thomas Built Bus delivered to our great customers here in the state of Florida goes through a multi-stage inspection process prior to delivery. First, the buses are checked at the factory before leaving. Then they are inspected at Rifled Air Conditioning. 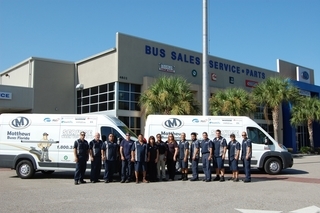 Once checked in at our Orlando location they go through a rigorous Thomas Built Buses PDI and FL DOE Inspection. After that a thorough cleaning and Final (wax) Detail is performed by our PDI staff. Johan Montoya is our new Detailer pictured below with the TEAM Matthews American Flag Hat and his detail tools in cart. Once complete, all buses are final QC’d by Chris Alfonso, Quality Control Manager, before being dispatched on a well planned delivery process to the customer. We encourage our customers to come see their new buses at our facility before delivery so we can make any desired adjustments. When at our facility, customers can confirm camera locations with Marty Riley, our on site Camera installer. All buses are put up on our lifts for a thourough inspection of the chassis, AC install, and underneath components - NO EXCEPTIONS! As part of our very detailed inspection process, all wheel lug nuts are tourqued using a tourge wrench to ensure the safety of the children and drivers. They are also tourqued properly at the Freightliner Chassis Factory prior to delivery to us. 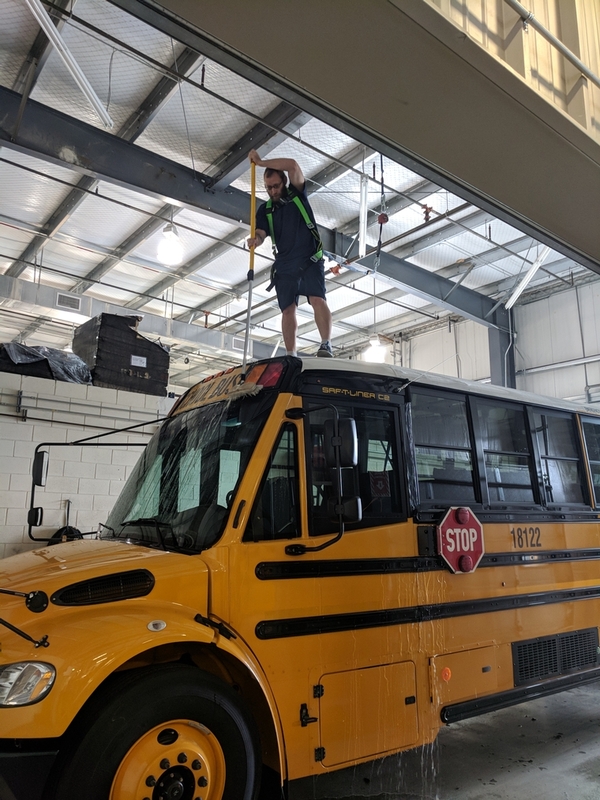 As part of our detailed process, our PDI techs inspect the entire bus including the roofs. Also pictured below is Brandan Groves "up on a roof" with safety harness attached. After delivery of the buses, a follow up inspection of our DOE/PDI to customers is analzyed by our QC Manager to identify any areas for possible improvements. At TEAM Matthews we strive for perfection. All of these processes are part of our Platinum Certified Support Efforts. Our goal is to deliver buses that the customer can immediately put into service. This is part of our "Legacy of Trust" with our great customers. We also realize there are no perfect buses or dealers but we strive for that every day for our great customers. Customers appreicate our desire and ability to respond quickly to issues as just one huge benefit when "Choosing Matthews." We are confident that we are the best in the business in responding to issues for our great customers. 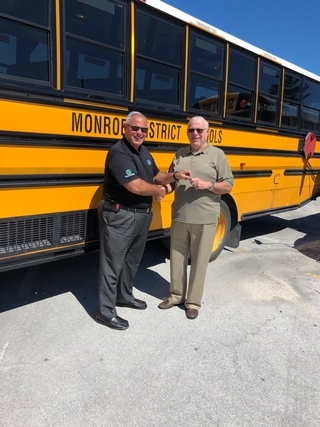 Frank Avendano, Monroe County School District Fleet Manager recently received the keys to their new 2019 Thomas Saf-T-Liner C2 Buses equipped with the Thomas S.T.A.R.S seating system from Cliff Clare, Jr. The STARS seating system allows Monroe County to remove all seats quickly and easily. 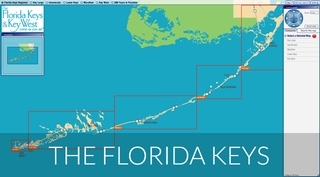 Both Frank and Randy Fabal, Director of Transportation, agree that STARS would have been a great help in the evacuation of the keys during huricane Irma. TEAM Matthews hopes everyone in Monroe County is doing well and recovering from Irma’s impact. This delivery marks the 5th straight year Monroe County School District has chosen Matthews to be their school bus supplier. TEAM Matthews Serious Mobile Service Program is very beneficial in helping Monroe County with warranty repairs. Thank you Monroe County for choosing Matthews! 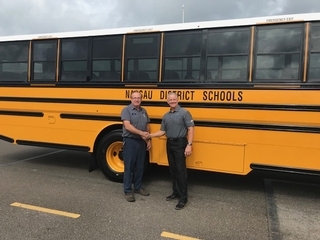 Rick Lucas takes delivery of Nassau County’s new 2018 Thomas Saf-T-Liner C2 buses from Tim Bevier, Matthews Bus Alliance, Inc., Professional Account Manager. Rick Lucas and staff commented on the beautiful buses and the amazing show room conditiion they were delivered in. Thank you for choosing Matthews Nassau County. 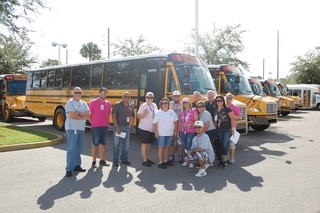 The staff from Nassau County recently visited the Matthews Bus Alliance, Inc. facility at 4802 West Colonial Drive to pre-inspect their buses prior to delivery and to meet the TEAM in Orlando. We encourage every customer to visit our faciltiy and meet our amazing 100% dedicated bus people. "Bus people serving great bus people!" In doing so they witness the 100% committment and dedication to FL school bus customers. President of Thomas gets great feedback! Caley Edgerly, President of Thomas Built Buses, presented to the FL Directors at the Mid Year Directors Meeting in Tallahasee, FL. He compared the changes in technology for buses as it realted to his new Mercedes sedan and his older restored pick up truck. Stating his childern relate more to the technology in his new car vs the older truck and his parents relate more to the trucks lack of technology. 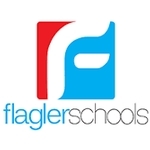 Thomas with the support of Daimler AG has all the latest modern technology and gadgets avaialble to it from its’ partnership with Daimler but it comes down to what’s needed and what’s affordable to FL school districts. Caley gathered a lot of great feedback from FL directors at the Diinner Hosted by Matthews Bus Alliance and Thomas Built Buses. We all look forward to what this valuable feedback will mean in terms of available options and technology for future Thomas Built Buses. Thanks Caley for caring about what’s important to FL Directors. Caley also highlighted the many benefits of the DD5 engine coming soon to FL districts. 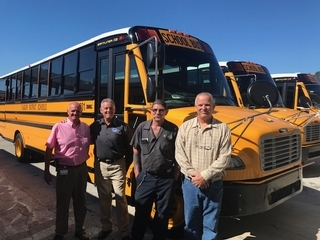 Loyd Cribbs and Chris Halligan joined Pete Fenderson, Glenn and Lori Matthews in High Point, NC to conduct a pilot model inspection for their 100 buses on order with Team Matthews. They also got to tour the Freightliner, Thomas, Rifled Air Conditioning, and Syntec Seating plants. They got to witness the care and quality that goes into ensuring the Safety of each and every Thomas Built C2 Bus. At Syntec they got to see the robust structure in the standard S3C convertible seats. At Thomas they got to see all the automation that goes into producing the repeatable quality of the C2 that makes it so popular with Florida School Districts. 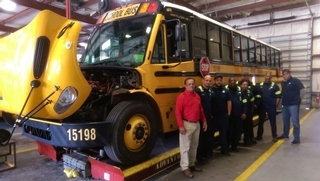 At RAC they got to see the manufacturing and installation of the best working school bus AC. They also go to see the new S.T.A.R.S seating system on one of the buses being air conditioned. At Freightliner they witnessed the care that goes into making the C2 chassis and how its integrated into the C2 Body for Safety. Thanks for choosing Matthews, Hillsborough County Schools! Everyone on our team really appreicates it and we look forward to delivering your new buses soon. 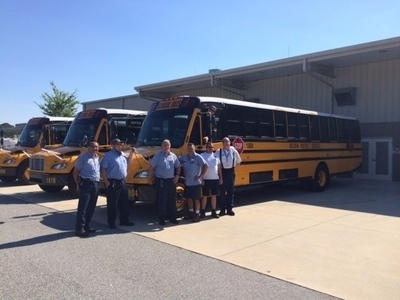 Hillsborough County Schools visited the Rifled Air Conditioning factory in High Point, NC after visiting Thomas Built Buses and conducting a pilot model inspection there. They witnesed the care that goes into each and every AC system that is manufactured and installed on site by the TEAM of Awesome Employees at RAC. Each of the 100 SDHC buses will be equipped with a 3 compressor system that includes an independant AC System for the driver which FL school bus drivers love. RAC is so confident in this system it is warrantied for 6 years in FL! 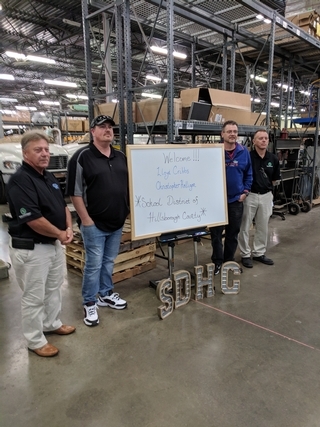 Pictured from left to right are Pete Fenderson (Matthews FL Sales Professional, Loyd Cribbs (Fleet Maintenance SDHC), Chris Halligan (Parts SDHC), and Dean Minor (General Manager RAC). 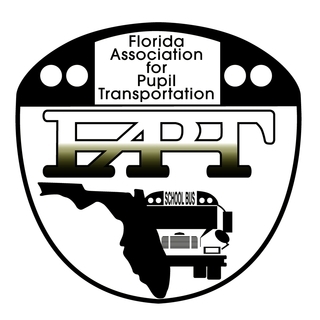 TEAM Matthews Bus Alliance, Inc., (Rifled Air Conditioning) and Thomas Built Buses are the proud Dinner Sponsors of the Florida Association of Pupil Transportation Mid Year Directors Meetings Held February 15th -16th, 2018 In Tallahassee, Florida. Caley Edgerly, President of Thomas Built Buses, and Glenn Matthews, President/CEO of Matthews Bus Alliance will provide a unique look into "Future Innovations" for Thomas Built School Buses in the State of Florida for years to come. 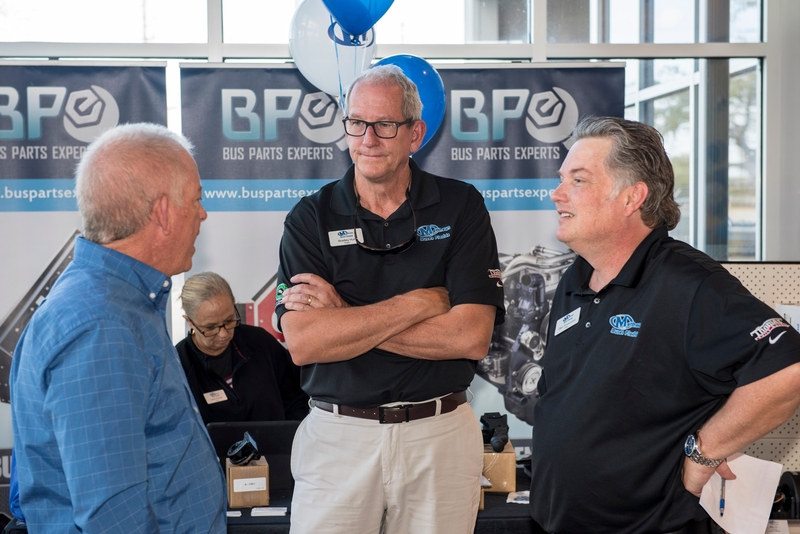 Pictured are Caley Edgerly and Glenn Matthews from this past years Thomas Built Buses Platinum Support Presentation to Matthews Matthews Buses Florida. 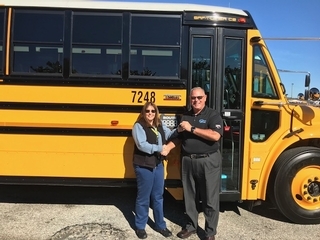 Fleet Analyst Angela Barbato of Palm Beach District Schools receives keys to one of their 47 new 2018, 77pass Thomas Saf-T-Liner C-2’s euipped with the RAC Max AC System , Seon Cameras, and Integrated Child Safety Seats from Account Manager Cliff Clare, Jr. Angela has been instrumental in the addition of Thomas C-2 to the Palm Beach Fleet. The Buses and TEAM Matthews are doing as promised in providing bus solutions that work well for the district. Thanks for Choosing Matthews Palm Beach County! 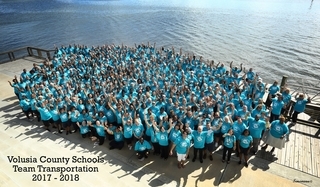 "On behalf of the Palm Beach County Schools Transportation Department we would like to applaud your efforts and commend your hard work on the speed and efficiency of delivery of our newly purchased buses. It is such a thrill to see them coming into the yard upon delivery and a huge relief to our aging fleet. I know the efforts you all put into this and I thank you." 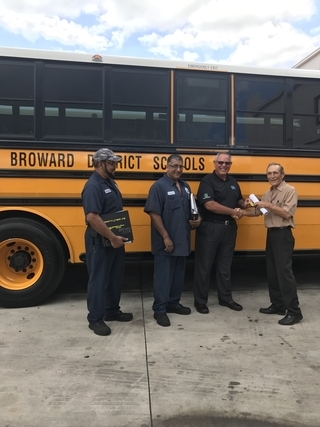 Miami Country Day School-Fleet Director, Allen Tongue, (center) and Bill Shaw receive Second Thomas C-2 from Matthews Bus Alliance, Inc., Acct. Mgr Cliff Clare Jr. Thanks for Choosing Matthews, Miami Country Day! More Palm Beach County Deliveries! Joel Rodriguez and Dian Enriquez of Palm Beach District Schools accept delivery from Cliff Clare, Jr TEAM Matthews Account Manager, of one of their new 47, 2018 Thomas Saf-T-Liner C-2’s. This delivery is part of the Second purchase this year to total 80 C-2’s. Thanks for Choosing Matthews, Palm Beach County! Palm Beach Holiday Cook Out A Success! On December 22, 2017 Palm Beach District Schools held their Fleet Staff Holiday Party. Over one hundred staff members were present and the food was incredible from a roasted pig to 100lbs of chicken and other homemade delicacies. The cooking started at 3am with the pig going on the spit and then the chicken on a homemade grill. Pictured is Fleet Operations Manager Lydia Sanchez with MBA Acct. Manager, Cliff Clare Jr., who arrived at 6am to help cook the chicken with Fleet General Manager, Carl Boucard, Shane Searchwell, Asst. Director, and Transportation Director, Pete DiDonato. 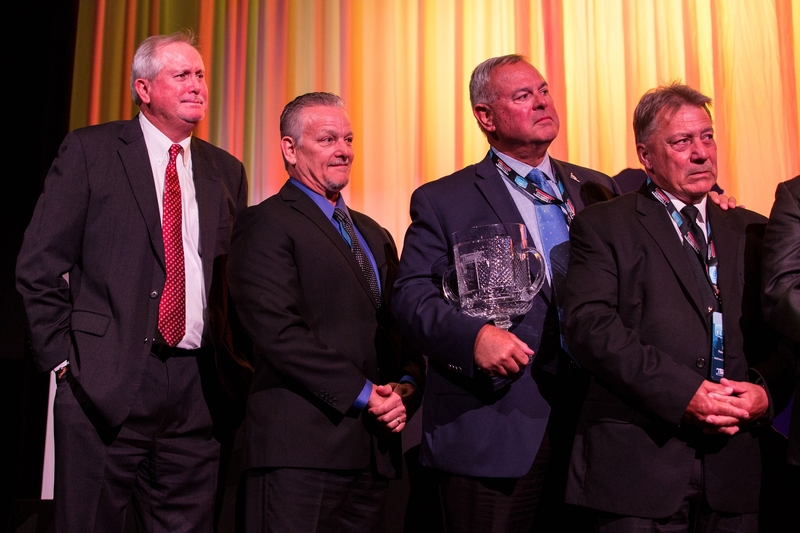 Matthews Bus Alliance, Inc., proudly sponsored the FAPT Driver of the Year Award. The award was given to Linda Sheldrake of Flagler County by Arby Creach, FAPT President, and Tony Conte, Transportation Director Flagler County. Pete Fenderson was on hand from Matthews Bus Alliance, Inc., to help present the Award. 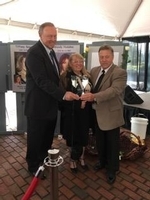 The Award was given at the 2017 Missing Children’s Day Ceremonies in Tallahassee Florida by The Florida Department of Law Enforcement, Missing Endangered Persons Information Clearinghouse Advisory Board. Linda received a take home plaque from Matthews Bus Alliance, Inc., in recognition of her accomplishments and will be honored on a permanent plague located in the offices of MBA as the first recipient of this annual award sponsored by MBA. Congratulations Linda! 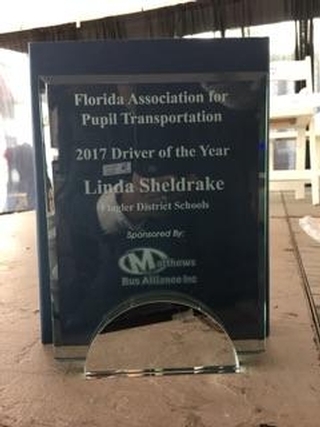 See PDF link below for Linda’s accomplishments as a school bus driver. Diesel? Highest MPG! Lowest Emmisions! CNG? Comparable MPG with higher infrastructure costs! Gas? Low MPG! How long will engine last? Fact: When you get 50% MPG LESS, Your Drivers are fueling buses twice as much! Click on link below to learn more! Matthews Bus Alliance, Inc., was on hand to support the Clay County District Schools Driver appreciation day. 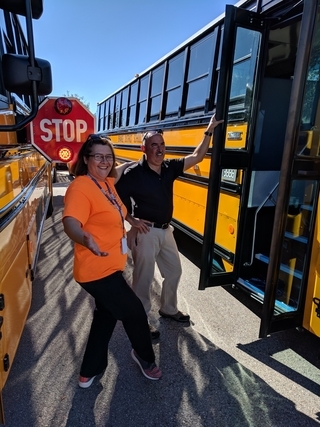 Chris Alfonso is pictured here with an Orange County District Schools Awesome Bus Driver. Chris is the new Quality Assurance Manager, and Platinum Support Continuous Improvement Coordinator at Matthews Bus Alliance, Inc. Chris comes to TEAM Matthews as a retired NYPD Officer and Service Manager of a local RV Dealership. As a result of Chris’ hiring we are raising the standards for the buses we deliver to our great customers. At Team Matthews we pride ourselves on the quality of the final detail and the accuracy of our Pre-Delivery and DOE inspections. Most customers say the buses we deliver are ready to be put in service immediately upon delivery. As part of our standard Platinum processes, Chris inspects each and every bus prior to delivery and follows up with customers post delivery. As our Platinum Support CIC, Chris will ensure the dealership is constantly striving for improvement. 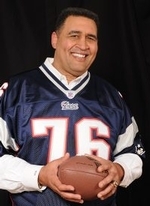 Welcome Aboard Chris Alfonso! Maurice Frye (Fleet Director), Thomas Conley, and Brandon Hunsinger, (Technicians) for Orange County District Schools visit Rifled Air Conditioning Systems for a Pilot Model Inspection and Plant Tour. They witnessed first hand the care that goes into each and every manufactured component that is installed by the TEAM at RAC. Pictured from Team Matthews are Glenn Matthews, (owner), Ron Vaughn and William Ferraro, Mobile Technicians. 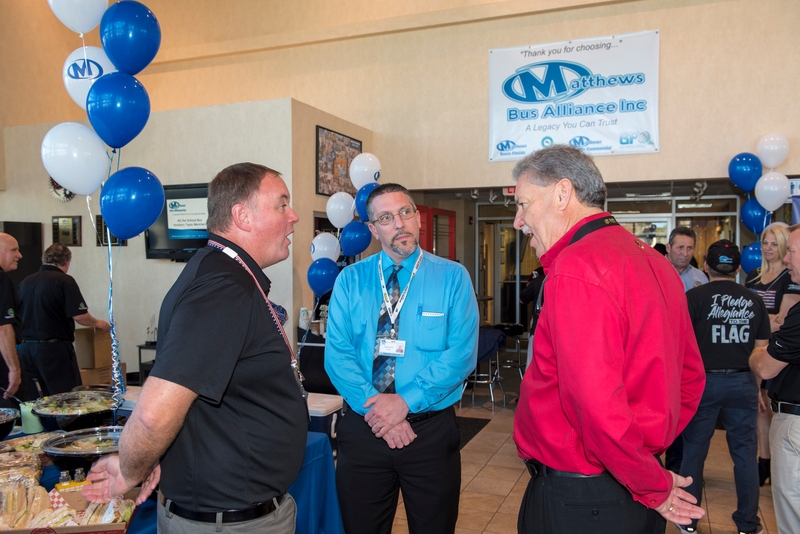 Matthews Bus Alliance, Inc., is the only bus dealer in the nation who manufactures and installs its’ own Air Conditioning Systems for its’ great customers. Orange County District School officials visited Freightliner Custom Chassis plant, Rifled Air Conditioning, Syntec Seating, and the totally unique Thomas Built Buses Saf-T-Liner C2 plant November 16-17, 2017 to see first hand how their Thomas Built Buses Saf-T-Liner C2 School Buses are made. The trip included inspection of their buses and some hands on training at RAC. Jamie Allison Southeast Regional Rep and Phyllis Summy of Thomas Built Buses directed the tour. On hand from Matthews Bus Alliance, Inc., were Glenn Matthews (President, CEO), Ron Vauhgn, and William Forero Road Service Technicians. For OCPS Maurice Frye (Fleet Director), Thomas Conley, and Brandon Hunsinger, (Technicians). Also on hand were technicians from Rifled Air Conditioning. We all learned a lot over the two days and witnessed the engineering that goes into every Thomas C2 from the wheels up. We learned that in a test situation the traditional construction methods used by Thomas on their legacy design conventional presently used by the competition start to loosen up in the shaker test after 20,000 reps. The Transit in 30,000 reps and the C2 not until after 40,000 reps. Thus the C2 truly is twice as strong under duress as the other conventional products on the market. Important to know when keeping your buses in service 10 years or longer. Durability and Reliability Matter! This difference is because of they structural adhesives used to build the C2 and the large bonded windshield design. There really is no comparing conventional products to the C2. The state of the art Robotic Thomas C2 plant is now 13 years old and remains the most state of the art school bus plant in the world. We were also greeted by the all new Thomas "Jouley" Electric bus upon its return from NAPT. This was a tremendous learning experience for all. 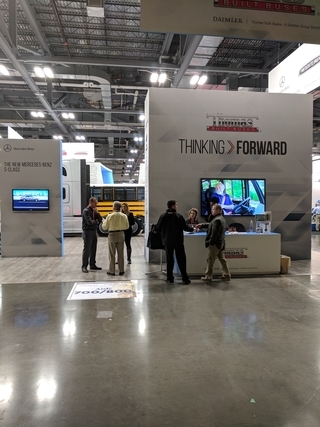 The theme of the Thomas NAPT booth this year was Thinking Forward which was evident by the vehicles and technology in the booth. Thomas benefits from all the engineering know how of Daimler. The all new Detroit DD5 engine provides short-haul pickup and delivery operators best-in-class maintenance intervals of up to 45,000 miles, to keep you working longer. The engine will also reduce the # regens and most importantly increase fuel economy. This engine will be available to Florida Customers Spring 2018 on FL DOE ITB: 2017-02! Ask your FL professional sales representative about it. Click on the link below for the Detroit Diesel Web Site pertaining to the DD5. 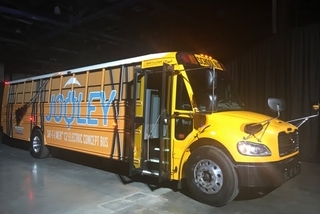 Thomas Built Buses Unveils Jouley at NAPT! Thomas Built Buses stole the show at NAPT with its’ all new Electric Powered Saf-T-Liner C2. It’s not what’s under the hood with this new bus! Somerset Academy takes delivery of a 2018 Thomas Saf-T-Liner C2. 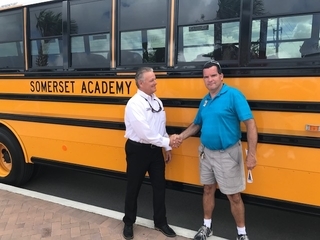 Pictured are Tim Bevier, Matthews Bus Alliance, Inc., Professional Sales Representative, and Gary Montagna Fleet Manager, Somerset Academy. Thanks for Choosing Matthews Somerset Academy! 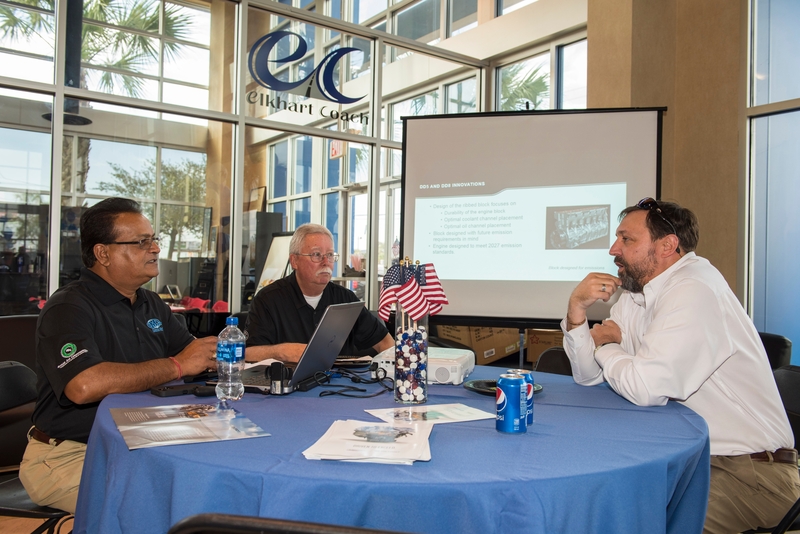 Cliff Clare, Jr., Matthews Bus Alliance, Inc., Professional Sales Representative Demo’s the latest S.T.A.R.S System to Volusia County’s Chris Boyer, Director of Transportation, and Mike Frazee, Fleet Supervisor. S.T.A.R.S - Safe-T-Anchor Removable Seat System. It is with great sadness we report that John Thomas, Jr age 90 passed away October 26, 2017. John Thomas, JR, Bob Matthews, Justine Matthews and family were very close friends and business associates. John was President of Thomas Built Buses and set our family up as a dealer over 50 years ago. 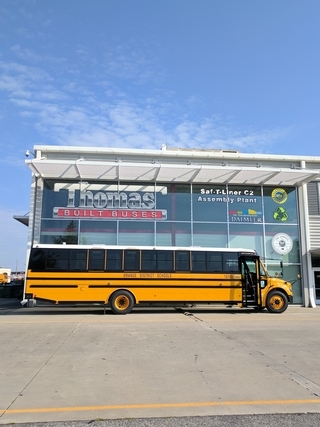 Thomas Built Buses is the great company it is today as a result of his entrepreneurial spirit and drive to be the best school bus manufacturer in the world. He will be sorely missed by everyone. The link to the obituary is listed below. 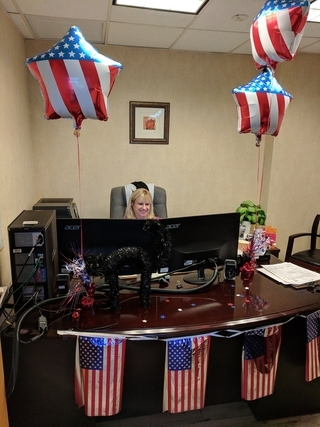 Congratulations to our very own Christine Stogner, Matthews Buses Commercial, Sales Coordinator Extraordinaire, for becoming a United States of America Citizen. We are so proud to have you as a fellow American. Those who know and work with Christine know how truly blessed we all are to have her on our amazing TEAM! Unbelievable, Super, Fantastic, Day! This was not without a lot of patience and effort on the part of Christine as she went through the legal process. We "SALUTE YOU!" WELL DONE Christine! Orange County District Schools Transportation Staff Take Delivery of their new 2018 Thomas Saf-T-Liner C2’s. Paul McGhee and Glenn Matthews passed out the keys and offered instructions on using the drivers independant A/C System. Matthews Bus Alliance, Inc., Shop Supervisor, Epi Martinez offloads some Hurricane Irma relief supplies from Thomas Built Buses, Inc., for Orange County Public Schools to use at their discretion. Steve Huckeba was on hand to take delivery and provide some nice comments to the local Orlando News Channels. Liberty District Schools took delivery on 9/28/17 of their new 77 passenger Thomas C2 Saf-T-Liner’s in partnership with the Daimler Tuck Financial and Matthews Bus Alliance. Pictured are Director of Maintenance/Transportation, Principal of Liberty High School and Head Technician. 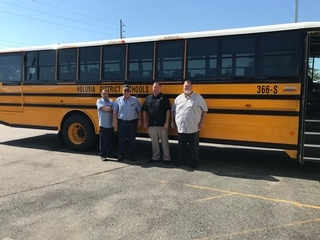 Each are excited to have Matthews Buses Alliance, Inc., in the house to keep their fleet in tip top shape and their drivers and passenger "cool" with the Rifled Air Conditioning systems. The buses were delivered and went immediately into service working for the district the following morning. Thanks Liberty for "Choosing Matthews!" See attached link to School Bus Fleet to see how to win with Diesel for your district! 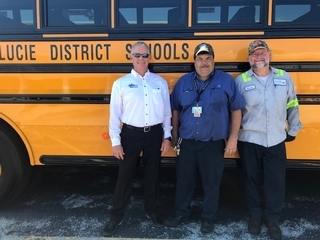 Steve L. Lucas (Fleet Manager Lee County), Jason Schilingburg, Dominick Lazano, (MBA Road Techs) pose with new Lee County District Schools 2018 Thomas C2’s. Lee took delivery of some New Thomas C2’s and some relief supplies from the employees at Matthews Bus Alliance, Inc. Robert Codie and the Lee County Communication Department did a FaceBook Live Event of the Delivery. Thanks Lee County For "Choosing Matthews!" Sept 10 and 11th, 2107 Irma impacted just about every county in the State of Florida. Most schools across the state closed for the entire week and some will not be open for quite some time. Florida school transportation departments were instrumental in evacuating people statewide. Many schools were used as shelters and some still are. We are so proud of these districts and their efforts to help people in need. Below is an article featured in School Bus Fleet. There is a nice video link that features Hillsborough County’s efforts in the evacuation. 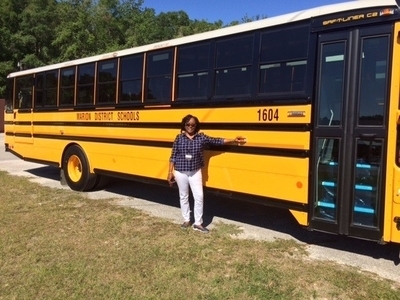 So proud to be a supplier of buses to each and everyone of the FL county schools listed in this article. We were without power at the dealership until Wednesday evening. We were fortunate to not have to much damage at the dealership and none of the new buses for delivery were affected thanks to the preparation efforts or our TEAM on Friday. Some of our employees are still without power and it has been tough getting gas for our Road Techs statewide. Our team is helping out wherever we can to help our great customers get back up an running. Power crews are working across the state to get schools back up and running. We hope all our great customers are fine and can get back to normal soon. September 22nd, 2017 is the Orange County District Schools "For Our Schools Golf Tournament" held at Grand Cypress Golf Course. Matthews Bus Alliance, Inc., is once again a Beverage Sponsor for the event. TEAM Matthews Technicians More Ready To Serve You! 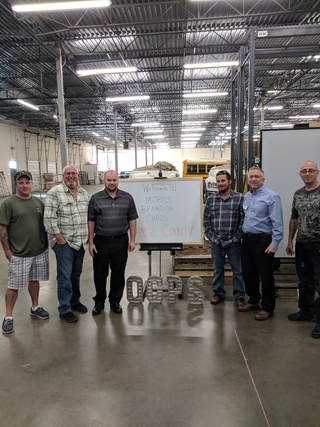 Matthews Service Technicians gathered at the Matthews Bus Alliance, Inc., headquarters in Orlando to receive more service training from Award Winning Trainer, Ali Rampartab. 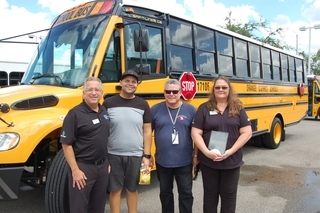 Pictured left to right is Cliff Clare, Matthews Buses Florida, Laurie Gaylord, Superintendent, and Kayleen Watts, Director of Transportation. 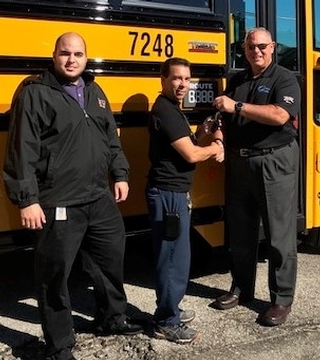 Mike Kriegal and service staff accept keys from Cliff Clare, Matthews Account Manager, and take delivery of one of their 30 2017 Thomas Built Buses SAF-T-LINER C2’s. Thanks for Choosing Matthews Broward County! 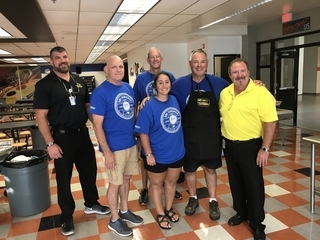 Team Matthews was back at it again this summer showing our appreciation for all the hard work school district transportation employees do making sure the kids are safe going to and from school. Pictured (left to right) are Brad Hull, Jeff Slack, Cliff Clare, and Pete Fenderson. Collier District Schools Transportation Dept. held it annual "In-Service" meeting with 450 staff in attendance. Brad Hull- MBF Parts Dept. Pictured: (TEAM Matthews) Ford Lyon, Jeff Slack, Cliff Clare (Polk County) Rob Davis, Asst. Supt. Support Services, and Don Stephenson, Fleet Manager. 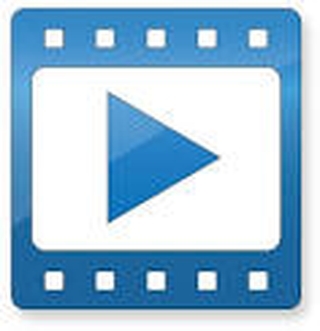 Service Training and Informational Videos Have Been Added To Our Video Library Found On The Home Page This Web Site Titled, "Videos"
Congratulations To Volusia County - "Kickoff! TEAM Matthews Supports Volusia "Kickoff"
Ali Rampartab, Platinum Thomas Built Buses TEAM Matthews Trainer, provided familiarization training for Volusia Counties driver’s and attendants in 5 sessions with roughly 70--80 attendees, per session. "Thomas The Bus Has Arrived!" was the theme. The lucky drivers to be getting the New Saf-T-Liner C2 77 passenger school buses with RAC air conditioning are very happy and excited to start the year. The drivers love the independant Dash A/C! 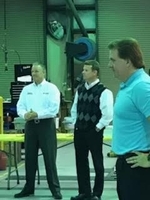 Caley Edgerly, President Thomas Built Buses joined Ali Rampartab (The absolute best HANDS ON TRAINER in the USA) at our Orlando facility to help train our technicians prior to our Annual Employee of The Year Luncheon. Great Job Ali and Caley! With the start of school upon us, check out this cool Dale Earnhardt Video dedicated to school bus drivers. 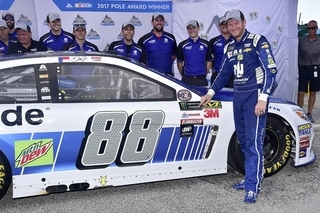 Great Job #88! 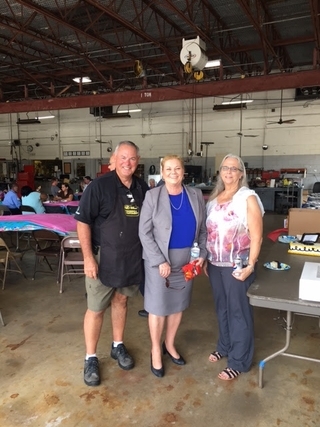 TBB President Visits Matthews Bus Alliance, Inc.
Everyone at Matthews Bus Alliance, Inc. was honored to have Caley Edgerly (President of Thomas Built Buses) and Jason Callahan (President of Local NC UAW Union) visit our dealership in Orlando, FL. 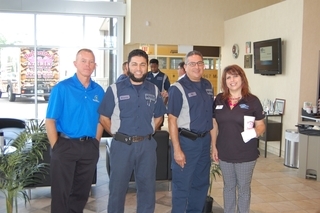 While at the dealership they took part in the annual "Employee of the Year Luncheon". Caley presented Glenn Matthews and TEAM Matthews Buses Florida with our Beautiful Platinum Support Certification Plaque. Caley had the opportunity to take part in some technician training being conducted by Ali Rampartab for our TEAM of technicians. Several local school district customers were also on hand to meet Caley and Jason. Thank you Caley and Jason for "Choosing Matthews" for your visit this year. 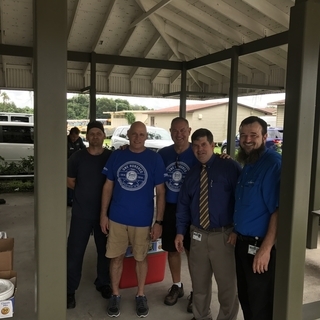 Pictured: Cliff Clare Jr. (MBA Acct Manager), Arby Creech (Director of Brevard County Schools), Caley Edgerly (President of Thomas Built Buses), Scott Pfender (Director of Lake County Schools) and Pete Fenderson (MBA Acct Manager). Matthews Bus Alliance held its’ first annual luncheon to celebrate our "Employee of the Year" for its’ dba Matthews Buses Florida. This award has been given for the past 6 years for Matthews Buses Florida Division and the past recipients are: Donald Helm, Glen Provenzano, Epi Martinez, DeAnne Martin and Donna Matura. This year’s award winner is Norma DeLung (Service Shop Manager). 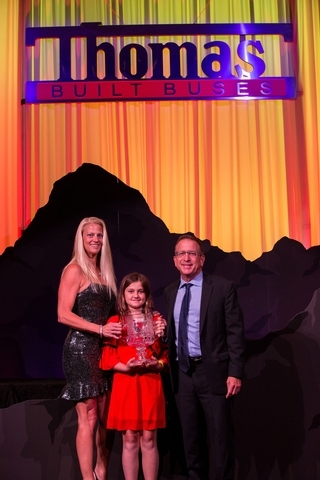 Pictured with Norma are Glenn Matthews (President and CEO of Matthews Bus Alliance, Inc.) and Caley Edgerly (President and CEO of Thomas Built Buses). This year the award title was changed to the "Donald Helm Employee of the Year Award." It is truly fitting that Norma was the award recipient this year as she was a very dear friend and co-worker with Donnie Helm; who was the nation’s top A/C technician before losing his courageous battle with Cancer. Both Norma and Donna have redefined the traditional shop structure with Norma excelling into a management role supervising the Orlando shop and doing all work orders as Service Writer, while Donna Matura manages our team of 14 dedicated bus road technicians. Norma and her TEAM PDI’d, DOE inspected, and delivered 60 buses in MBA’s first month as a new company within two weeks after FL DMV License delays. This effort on behalf of Norma and her TEAM got MBA off to a fantastic start and they continue to PDI, DOE Inspect and deliver over 60 buses a month each and every month while also doing retail and warranty service work in the shop. 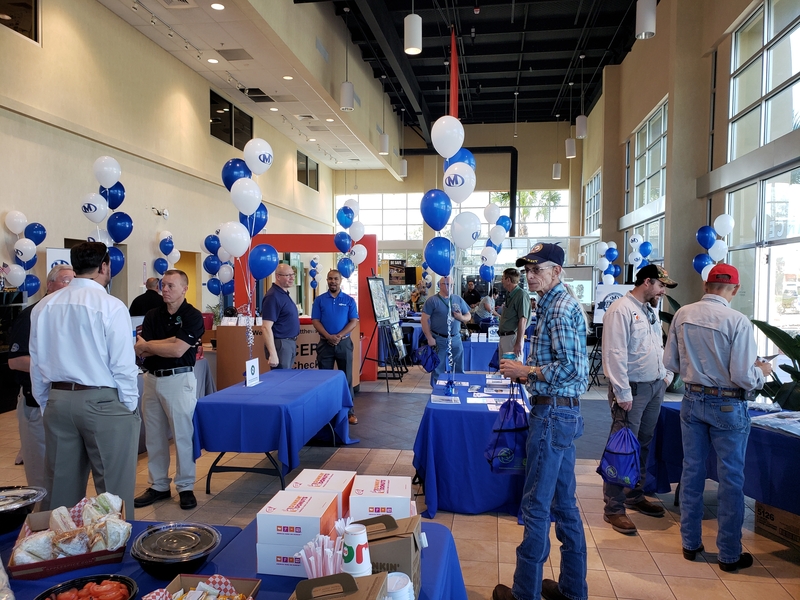 Also on hand were some of our local customers including: Orange County, Lake County, Brevard County and Volusia County to honor Norma and experience our Employee of the Year Luncheon. Thank you to all those customers who were able to take time out of their very busy schedules this time of year on such short notice to be with us and to meet Caley and Jason. Dean Minor (General Manager of Rifled Air Conditioning), visited MBA Orlando on August 4, 2017. 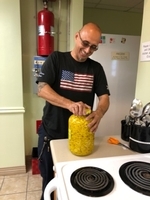 He is pictured with Roberto Gonzales (Road Technician), Epi Martinez (Shop Floor Supervisor and Quality Control Manager) and Donna Matura (Mobile Technician Service Manager). The 2017 FAPT Summer Symposium Trade Show was held July 3 rd, 2017 at the TPAC Sawgrass Marriott. Pictured are Osceola District Supervisor Shawn Tucker and Cliff Clare, MBA Account Representative. Legendary Miami Dolphin who is in the Ring of Honor at Hard Rock Stadium, Mark Duper, was on hand at the MBA booth to greet customers. 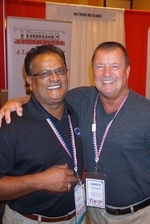 Chico Moore, Fleet Director from Marion County with Ali Rampartab, Platinum Level Trainer for MBA. Jason Harris from Manatee District Schools. MBA showed off the all new 2017 Thomas Saf-T-Liner C2 CNG powered school bus. This unit is availabe for demonstration. Please contact your MBA account representative for a Free Demo. 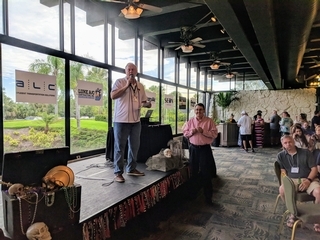 Bob Dolan of MBA supervised the Golf Tournament on Behalf of FAPT and Don Ross, Sales Director MBA, was responsible for all vendor activities this year. All in all attendees and vendors enjoyed the beautiful facility and meetings. 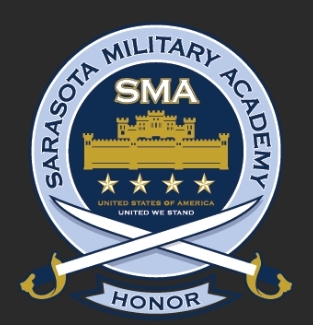 Accepting the 2017 Thomas Saf-T-Liner C2 buses are the Business Director, SMA-Major Steve Kok, and new Transportation Route Supervisor SMA-Major Beth Harris who joins Sarasota Military with 31 years experience in School Transportation. Buses were presented by Matthews Bus Alliance, Inc. Account Manager Pete Fenderson. Also attending the orientation is SMA-Captain Kevin Nasby. 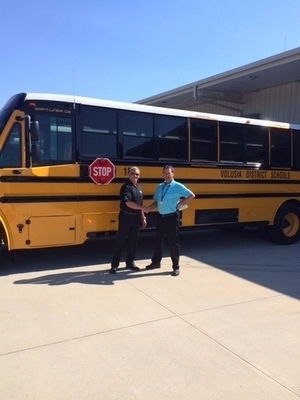 Bill French Assistant Director Transportation Services for Volusia County takes delivery of the first 9 of 25 C2 77 passenger buses from Matthews Buses Florida Account Manager, Tim BeVier. 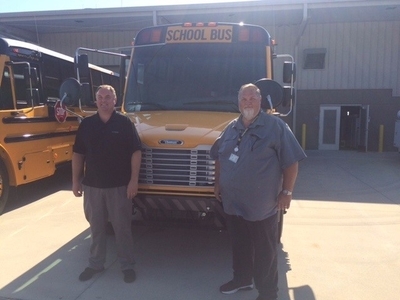 John Wilson and James Wade shop managers for Volusia County Transportation inspect new Thomas C2 bus deliveries from Matthews Buses Florida. Matthews Buses Florida participated in the First Annual Orange County Public Schools Operations Employee Car and Bike Show by displaying our 1967 Thomas Classic School Bus. 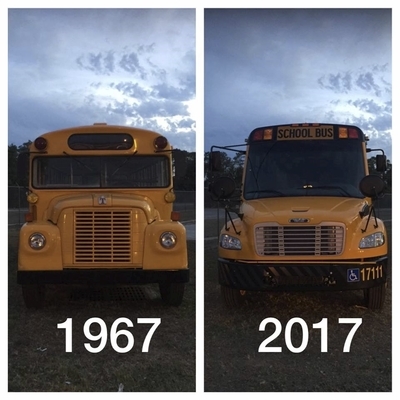 Pictured are the 1967 bus next to a 2017 OCPS Thomas C2 and the 1967 classic school bus next to 1967 Impala. 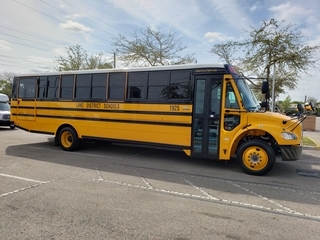 Matthews Buses Florida delivers 9 Thomas 77 passenger C2’s and 4 Thomas 77 passenger C2’s with Wheelchair Lifts to Marion County School District. The buses feature Rifled Air Conditioning AC Systems, Ricon Lifts and Gate Keeper Camera Systems. This is the second group of C2 buses received by Marion County after making the decision to switch to Team Matthews. Receiving the deliveries for Marion County is Rebecca Rora, Transportation Director and Chico Moore, Fleet Maintenance Supervisor. Thank you, Marion County, for choosing Matthews! 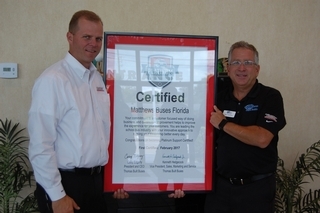 Congratulations To Matthews Buses Florida for Going Platinum! Platinum Support that is! 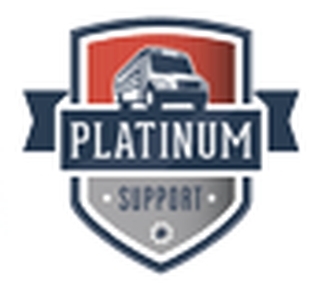 Platinum Support is a collaborative effort between Thomas Built Buses and its dealers, focused on improving the customer experience. Platinum Support provides rapid diagnosis, responsive turnaround and quality, consistent communication, robust parts availability and superb customer service; all provided by a highly-trained staff. 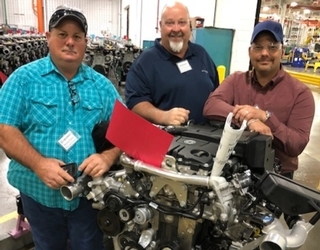 Through rigorous Platinum Support training, dealers learn to eliminate all areas of waste from day-to-day business practices, including faster vehicle assessment, reducing vehicle down time and lowering vehicle life cycle costs to the customer. Matthews Buses Florida was honored once again as a Platinum Level Dealer at the 2017 Thomas Built Buses International Sales Meeting in Dallas Texas. This is the highest level attainable from Thomas Built Buses. Congratulations to Carolina Thomas for being selected Southeast Regional Dealer of the year (Thomas’ Strongest Region) and overall Dealer of the Year! Ali Rampartab was honored once again as a Platinum Level Trainer. 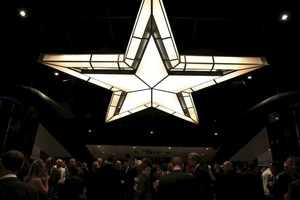 This year’s Dealer of the Year Reception was held at the AT&T Dallas Cowboys Stadium fittingly to honor us Platinum Level Dealers as Champions for Thomas Built Buses. 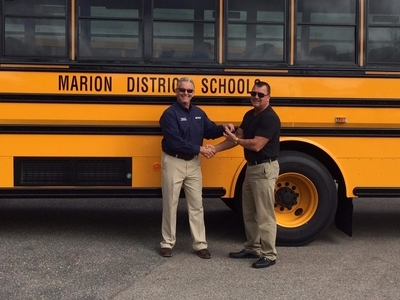 Marion County Receives Delivery of their Thomas Built Bus from Matthews Buses Florida. 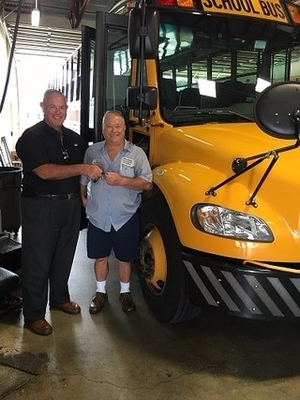 Marion County’s Maintenance Supervisor Chico Moore received the keys to their Thomas Built Bus from Matthews Buses Florida’s Account Manager, Tim BeVier. Marion County will receive delivery of 9 C2s and 4 C2 lift buses in the second quarter of 2017. Matthews Buses Florida is pleased to welcome Bob Dolan to TEAM Matthews! Bob Dolan has accepted the position of Account Manager with Matthews Buses Florida. 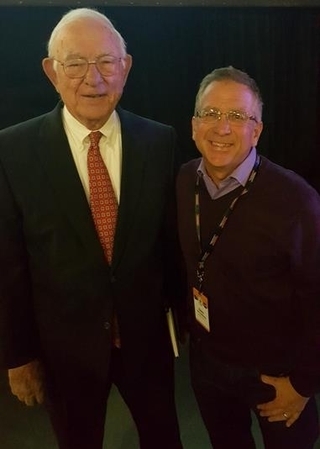 He brings with him 35 years of sales and sales management experience with some of the largest sales organizations in the United States. 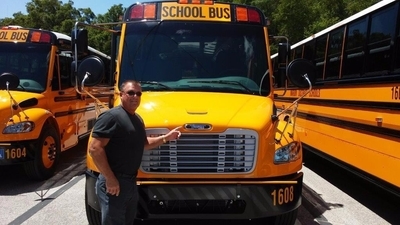 Bob’s experience in the school bus industry has given him in-depth knowledge of the needs of the school districts making him one of the top account managers for bus sales specializing in large counties throughout Florida. Please join us in congratulating Bob. Rifled Air Conditioning in High Point, NC welcomed Orange County Schools as they viewed for the first time the newly designed front bulk head AC and 3 compressor bracket. Comments were "wow what a difference", "it’s cold in here" as they commented on the AC flow from front to back! 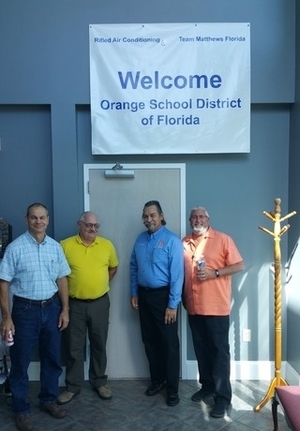 The Orange County team was joined by Matthews Buses Florida, General Manager, Don Ross. Director of Transportation Arby Creach (right) and Assistant Director of Transportation Randy Wheeler (left) with Brevard County Schools are receiving delivery of the first of nineteen (19) new Thomas C2 Saf-T-Liner Buses from Matthews Buses Florida’s Account Manager, Cliff Clare Jr.
Brevard County Schools will receive a total of nineteen (19) new Thomas C2 Saf-T-Liner Buses from Matthews Buses Florida’s. Thanks Brevard for choosing Matthews! TEAM RAC manufactured and installed its’ 3 compressor AC System for City of Lauderdale with 55k more TRUE BTU’s more then any competitor in Fl. Great Job TEAM! 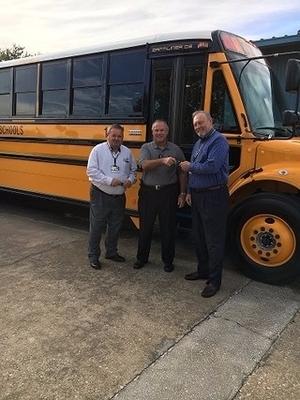 Matthews Buses Florida’s Cliff Clare Jr., Account Manager, is handing over the keys to the first delivery of a new Thomas C-2 Saf-T-Liner to Jerry Briggs, Fleet Manager of Martin County Schools. Martin County Schools will receive a total of fifteen (15) new Thomas C-2 Saf-T-Liner Buses this year from Matthews Buses Florida. Thanks Martin for choosing Matthews!